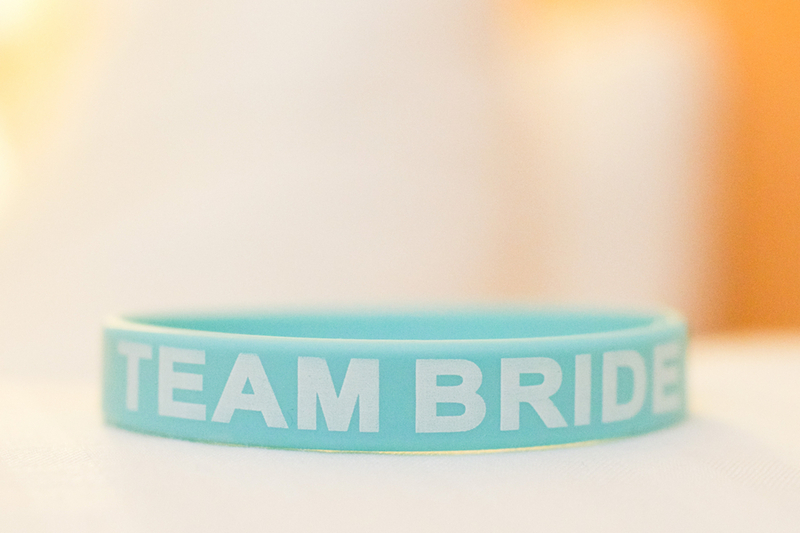 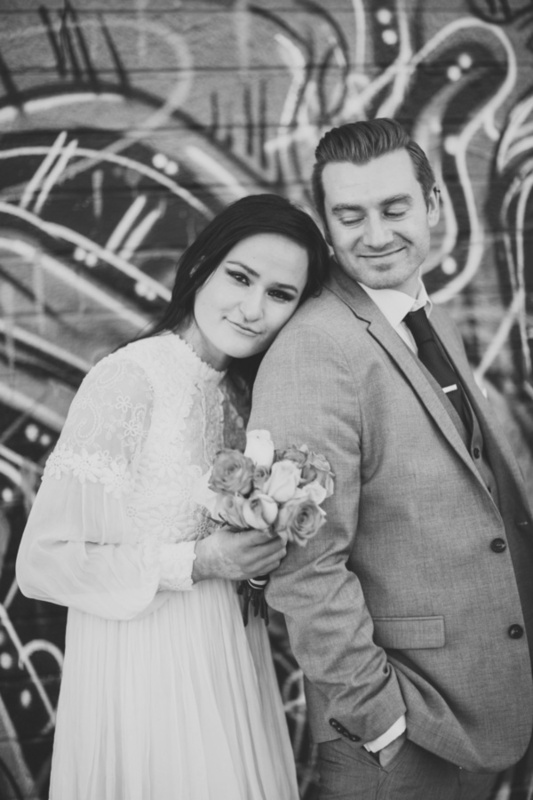 So let’s talk about wedding stress. 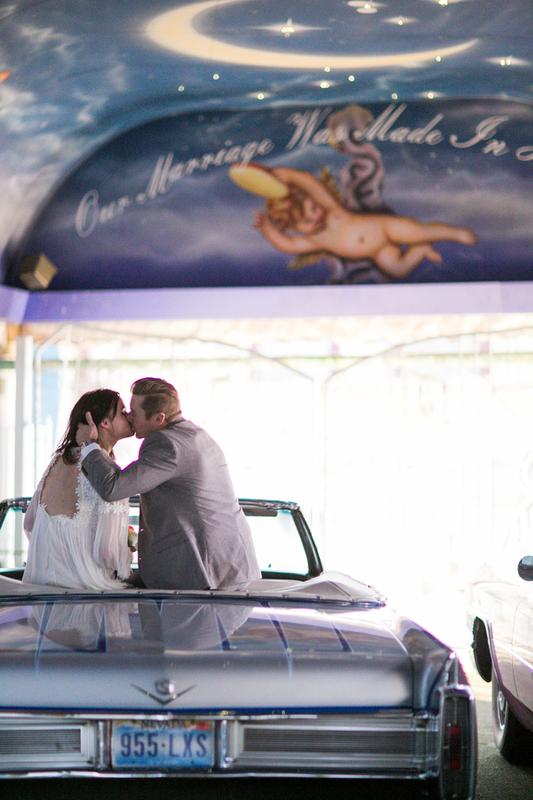 Maybe you’re going through this right now, even. 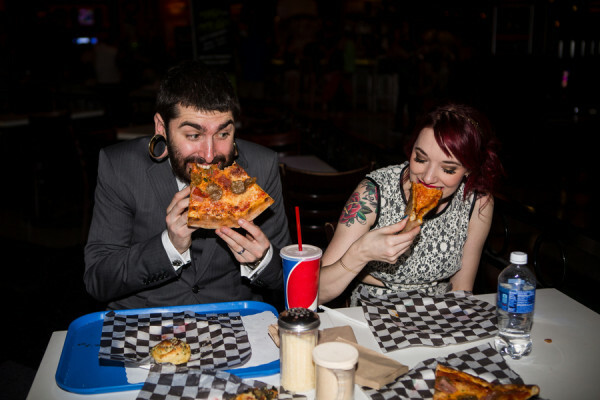 Planning a wedding is tough. 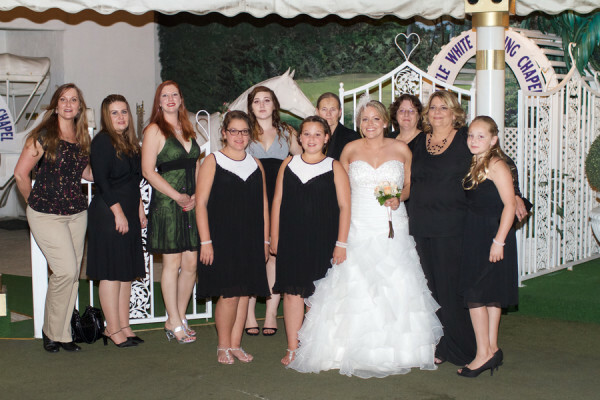 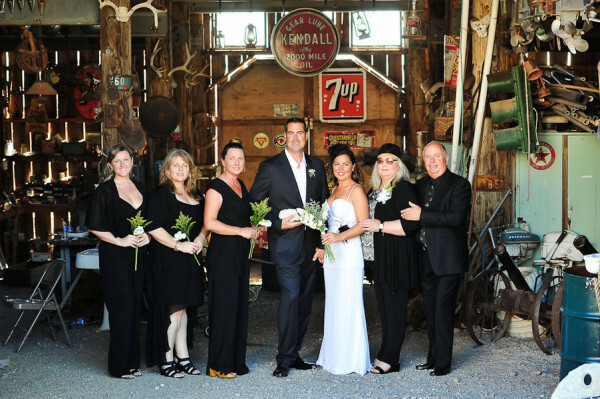 Slow RSVPers and menus and budgets and what to wear and looking your best and cousin Jo can’t sit next to aunt Mary and … well you get the idea. 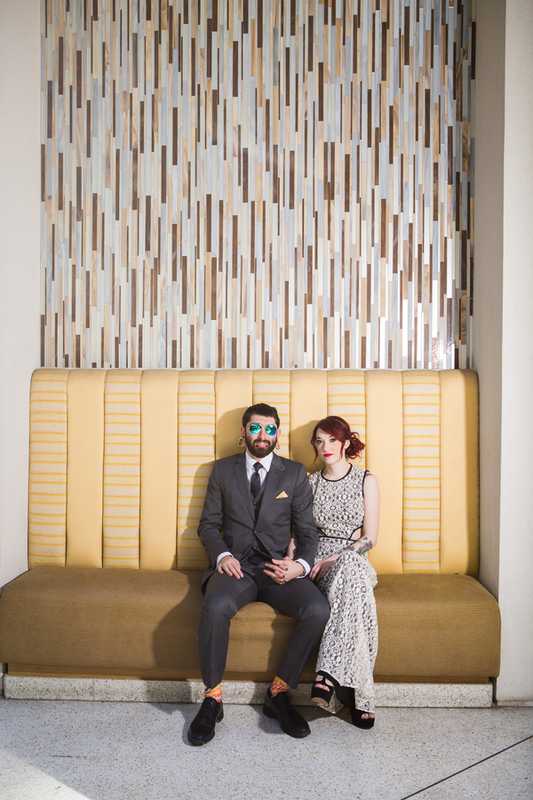 Livia and Mike sidestepped all of that when they decided that the big wedding they were planning at home in Canada was just not their style. 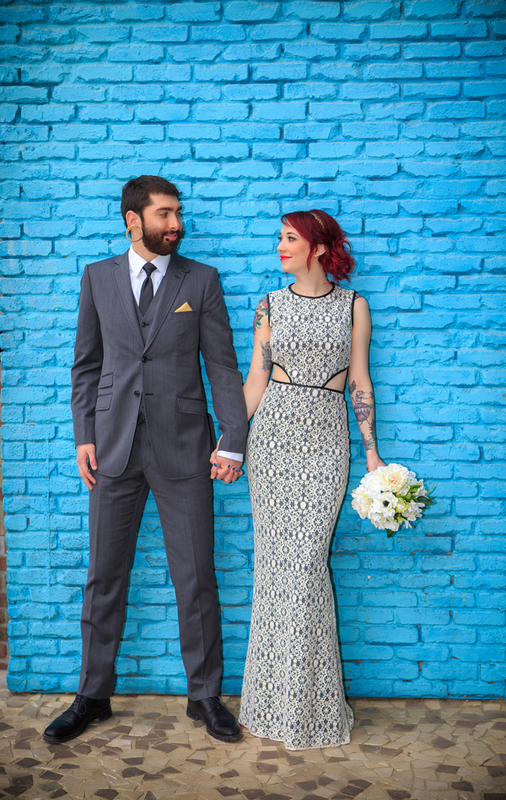 What WAS their style? 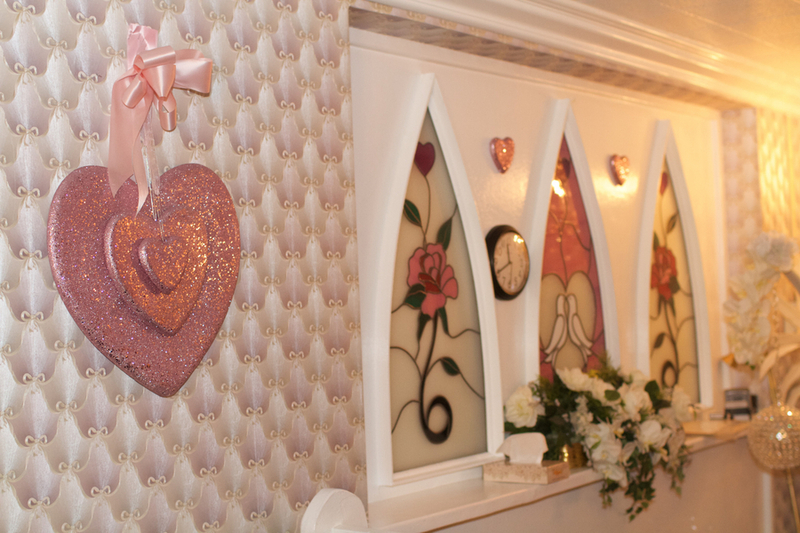 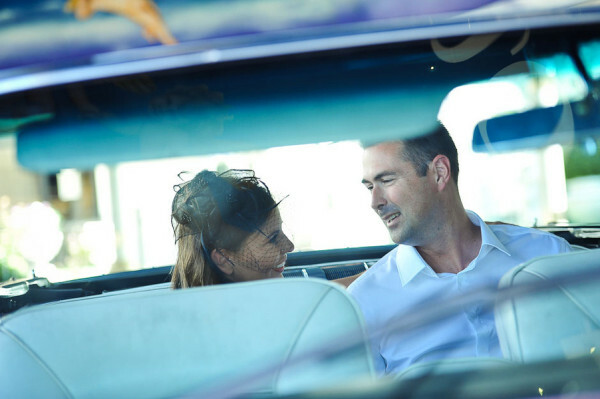 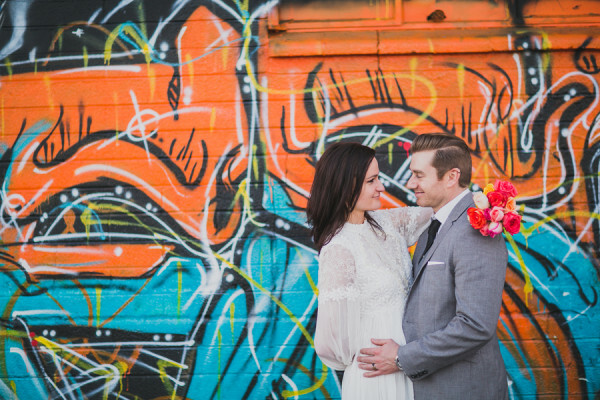 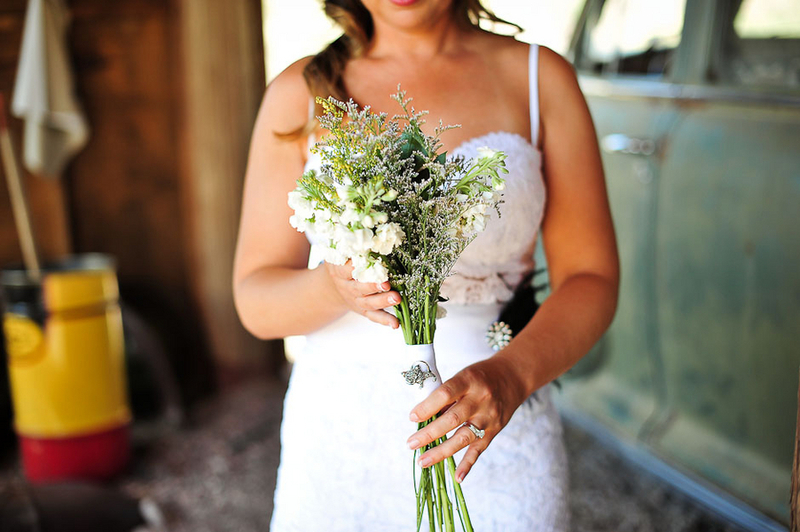 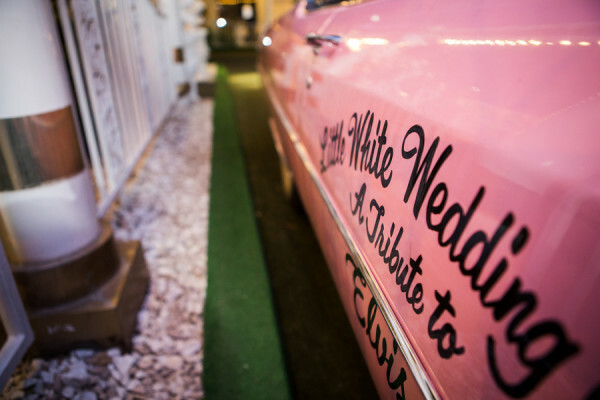 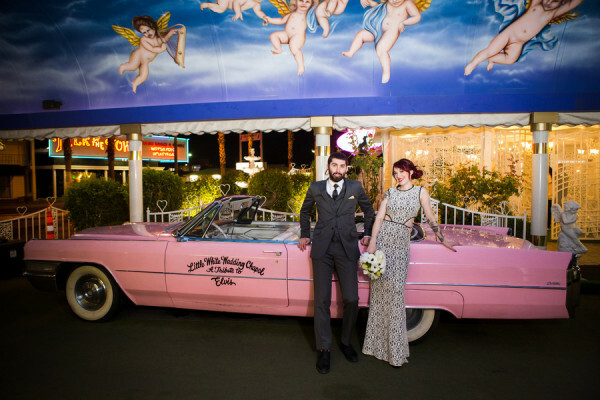 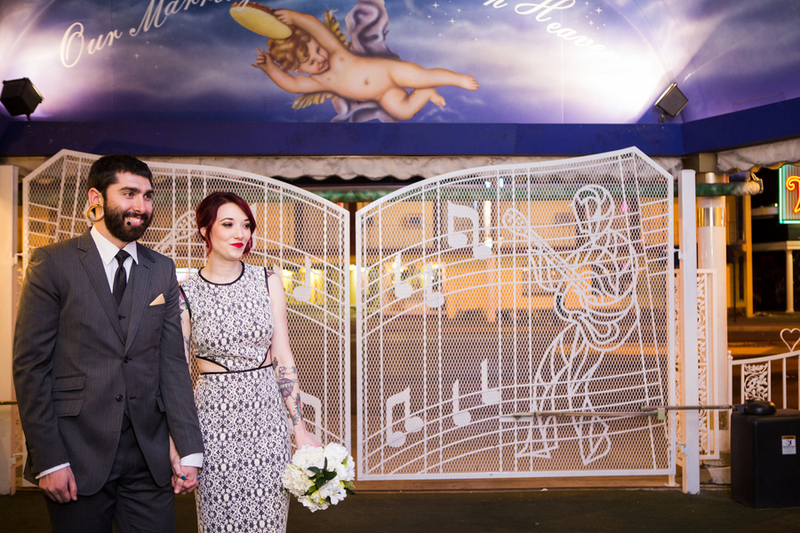 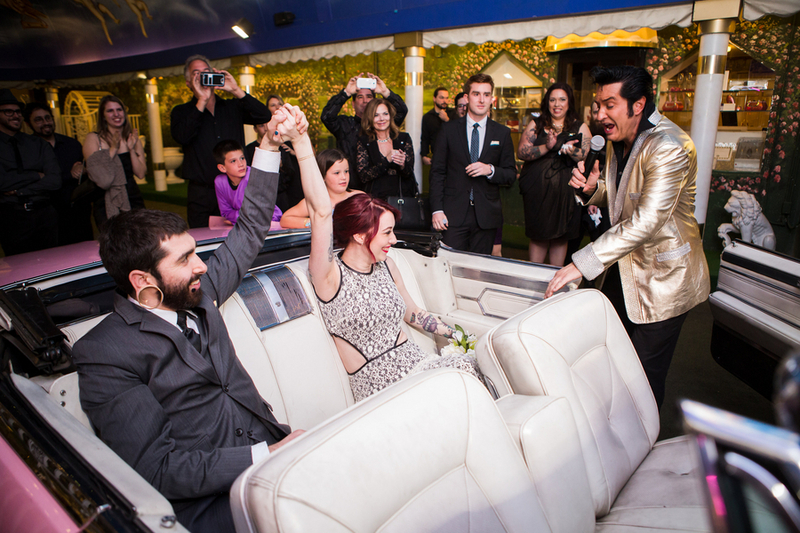 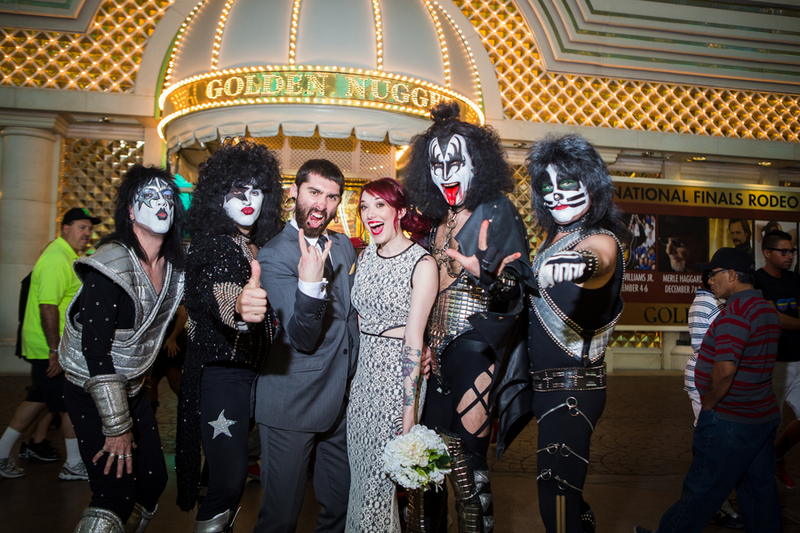 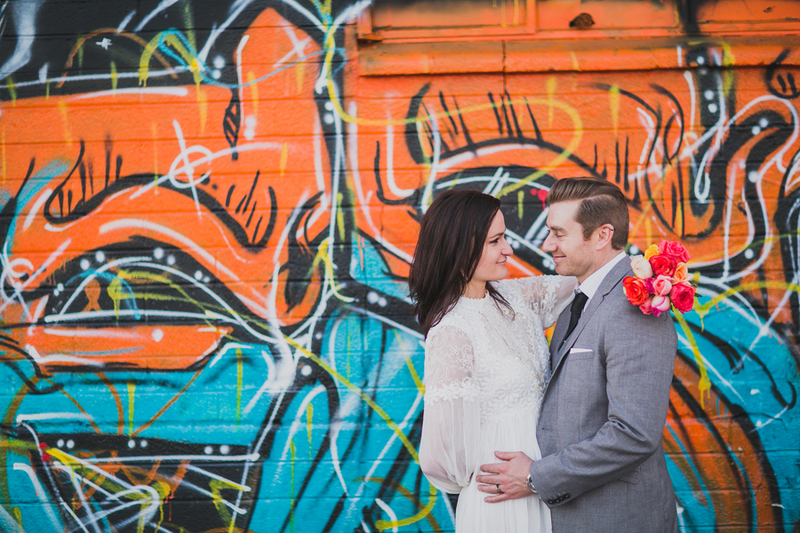 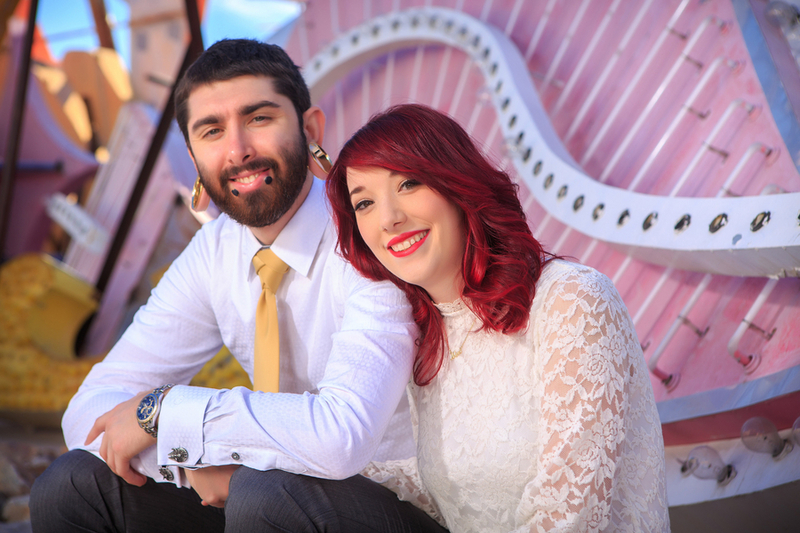 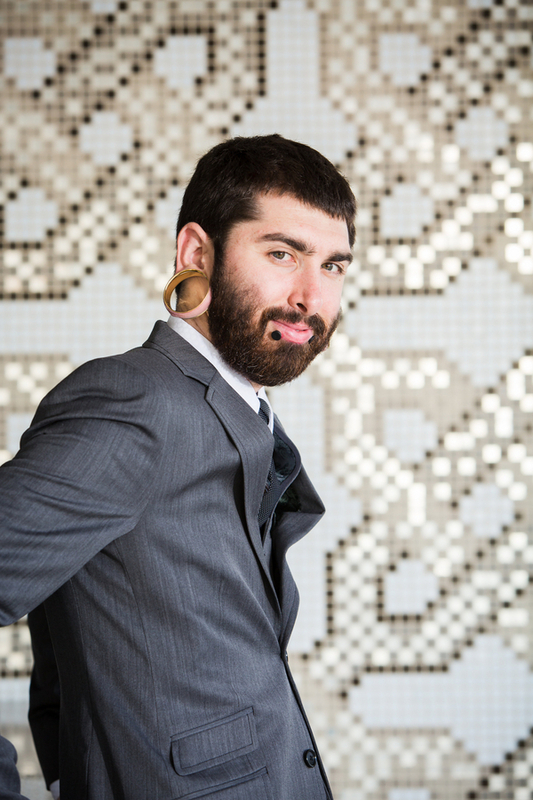 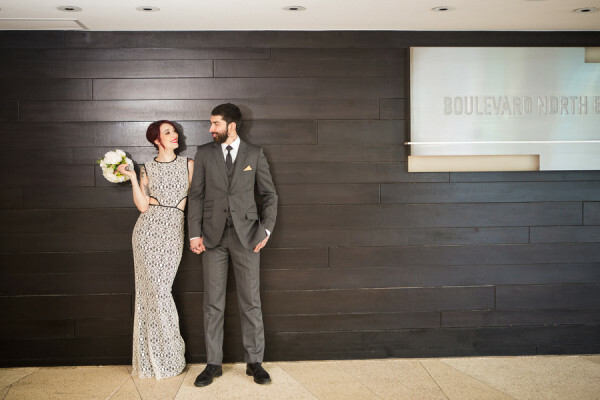 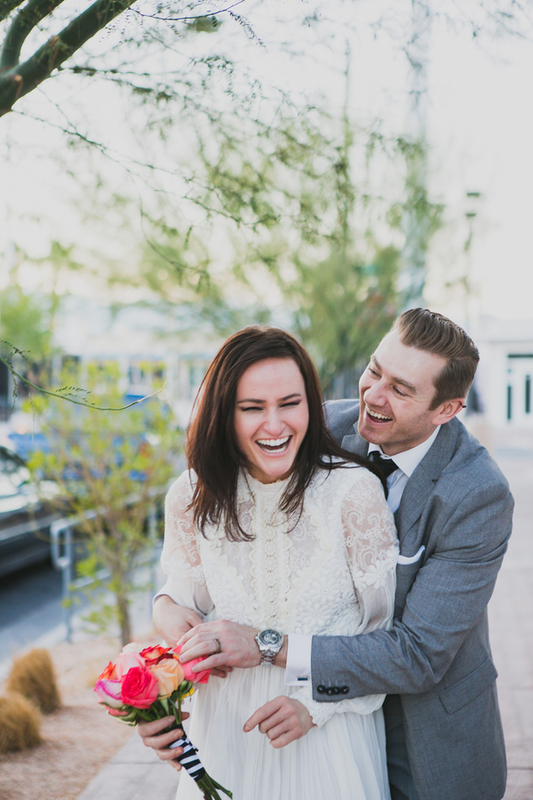 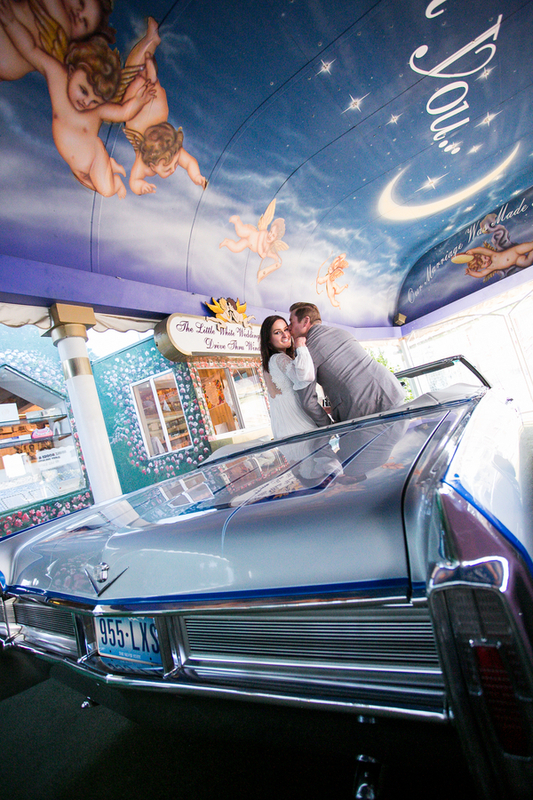 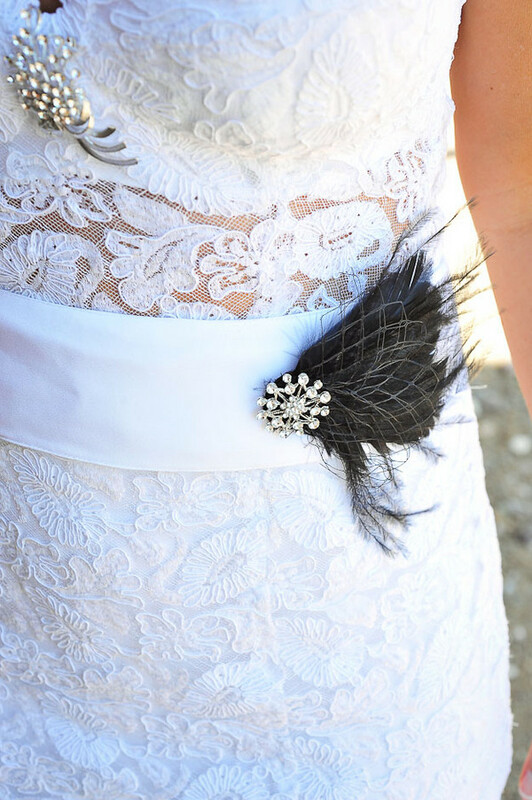 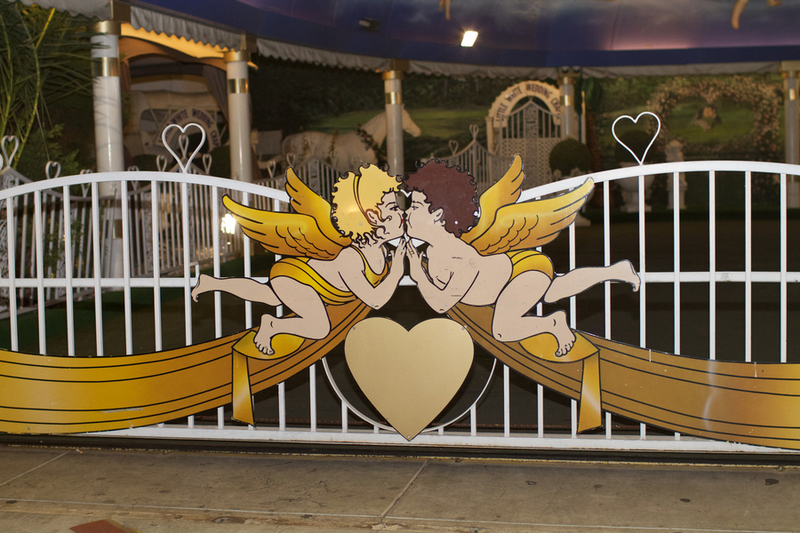 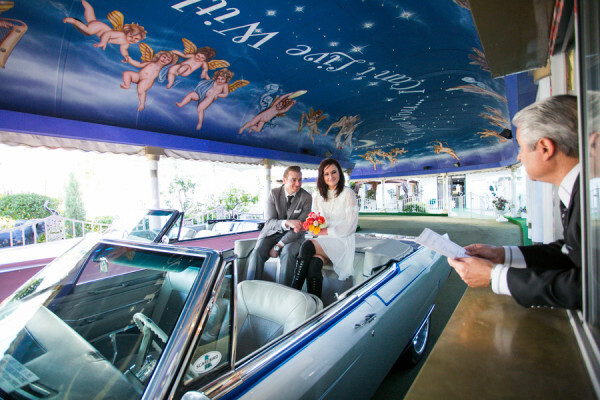 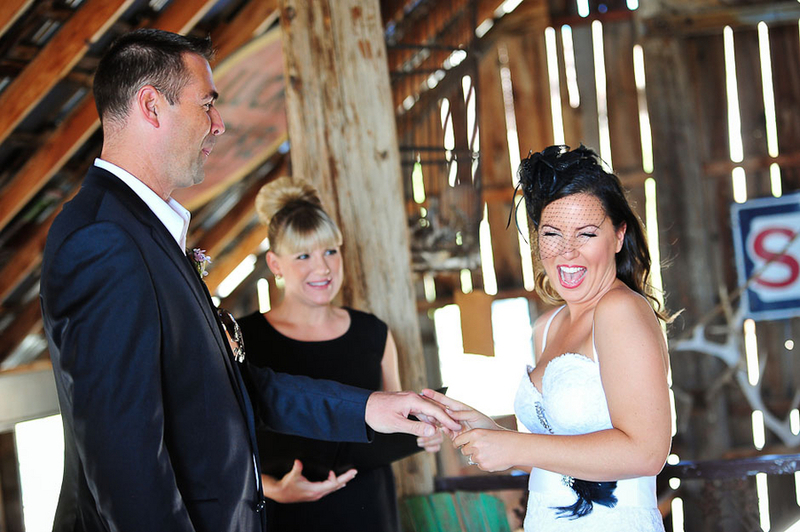 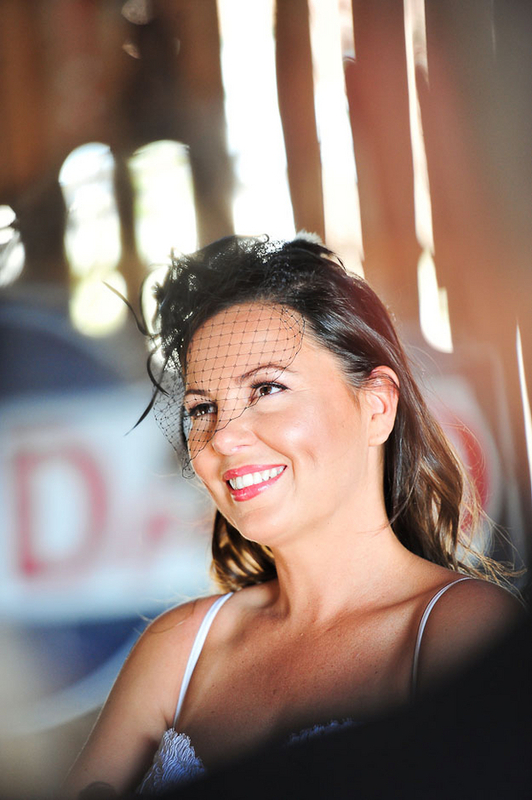 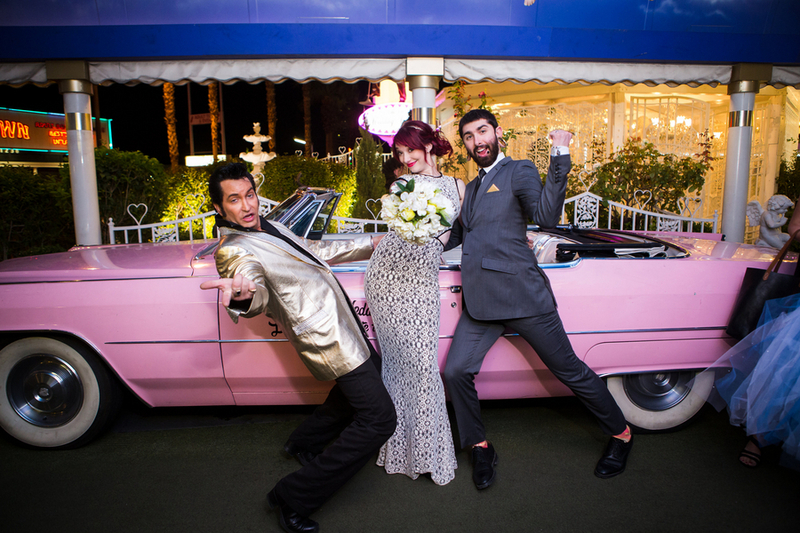 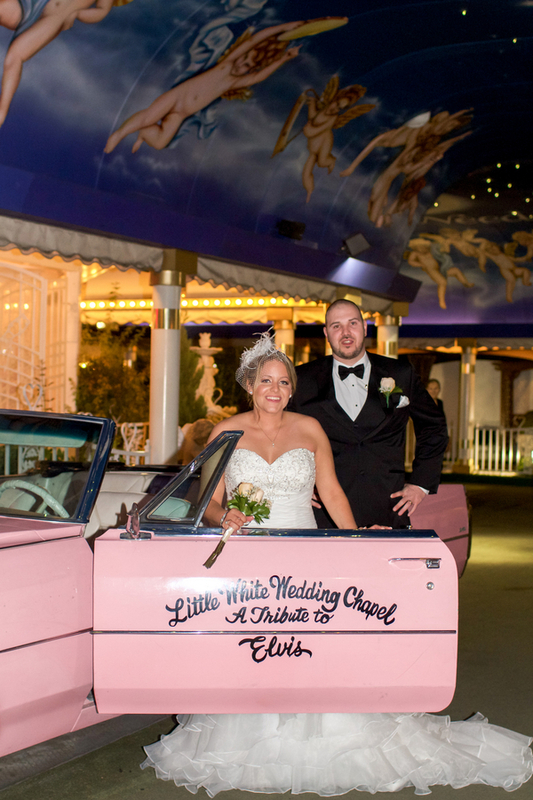 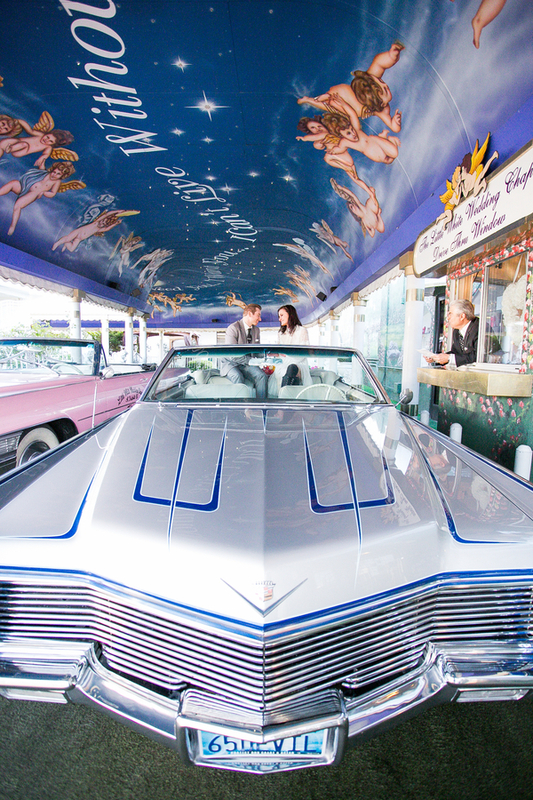 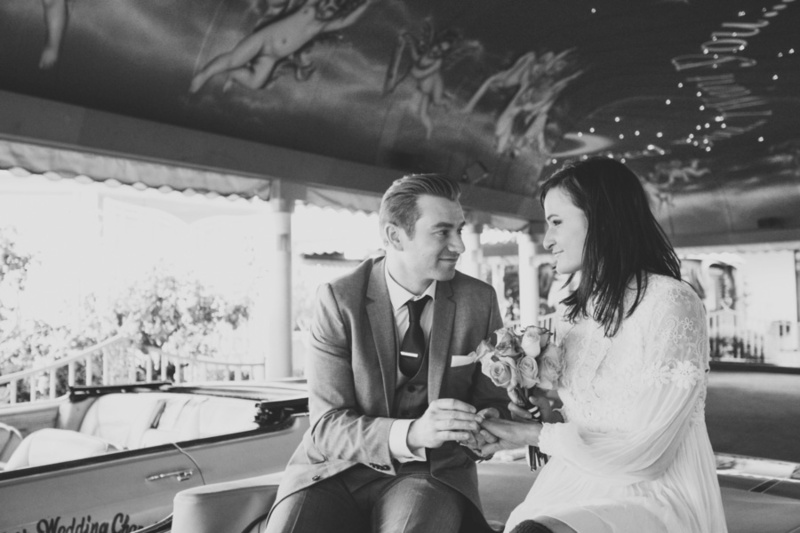 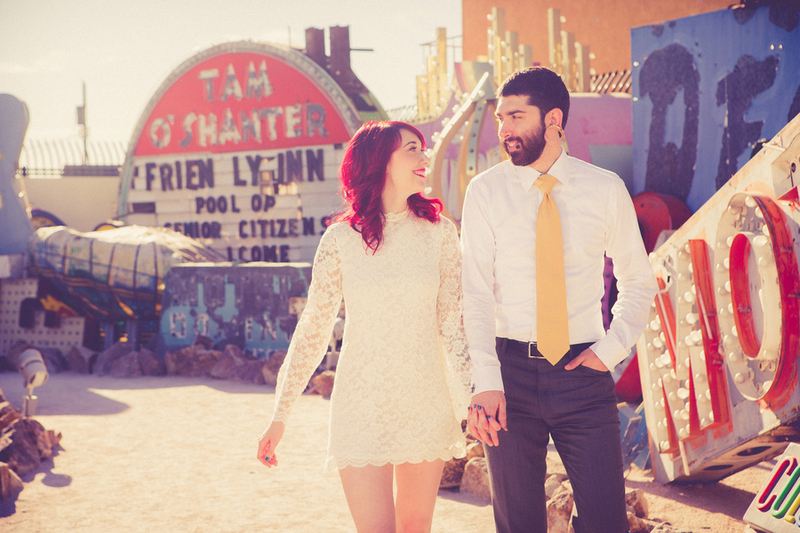 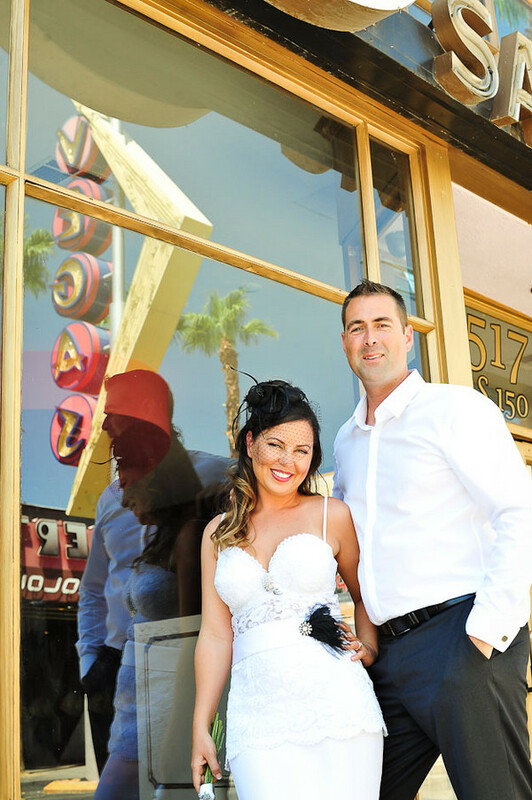 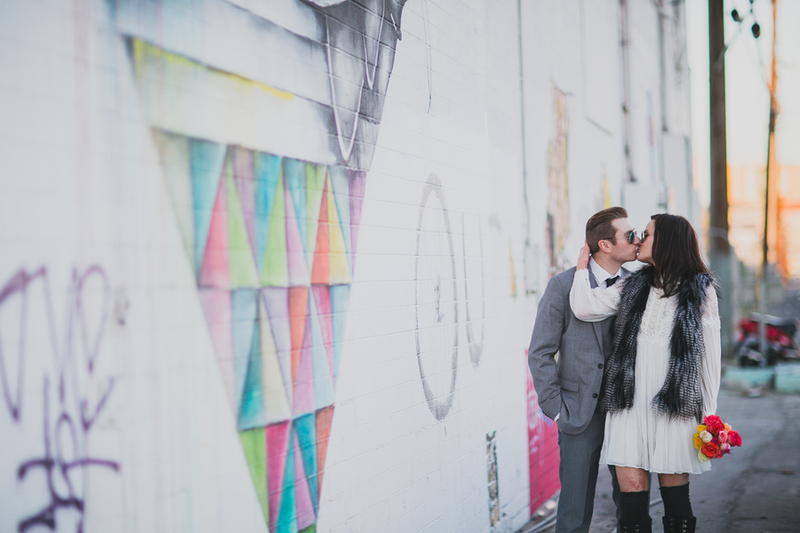 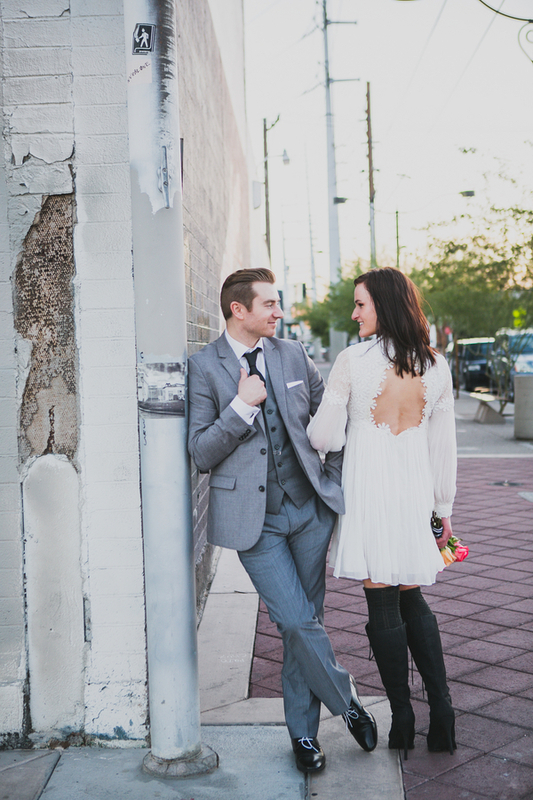 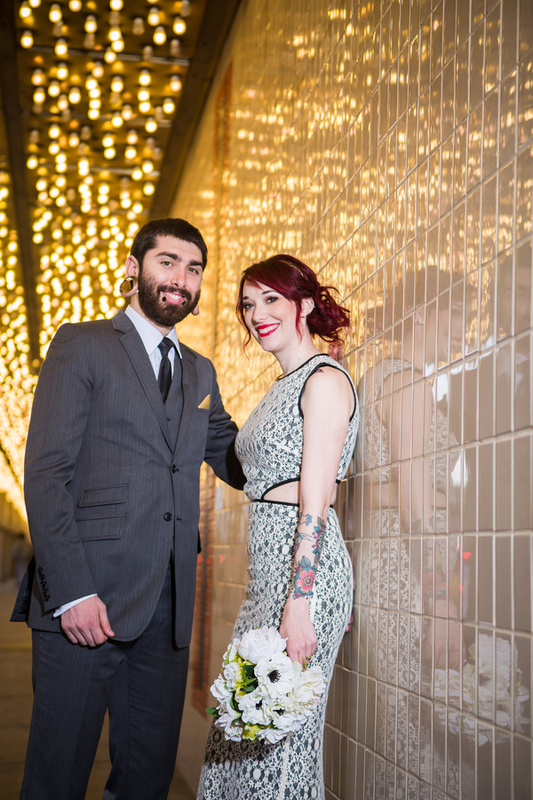 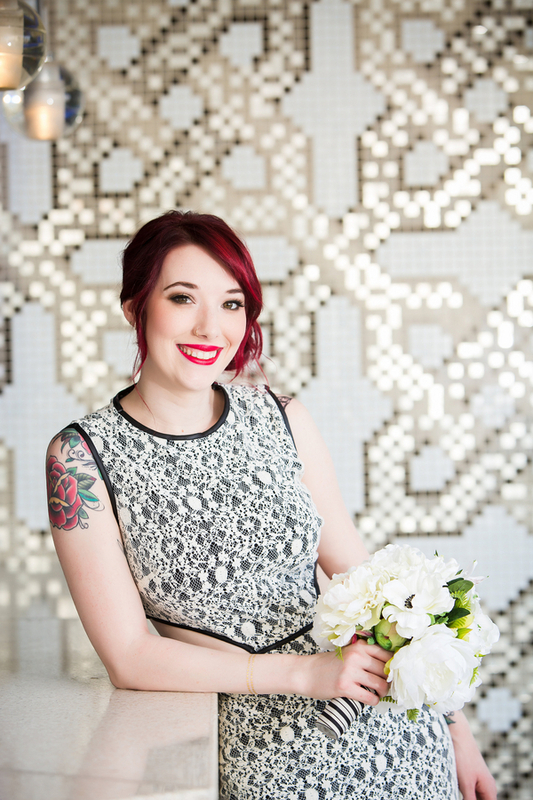 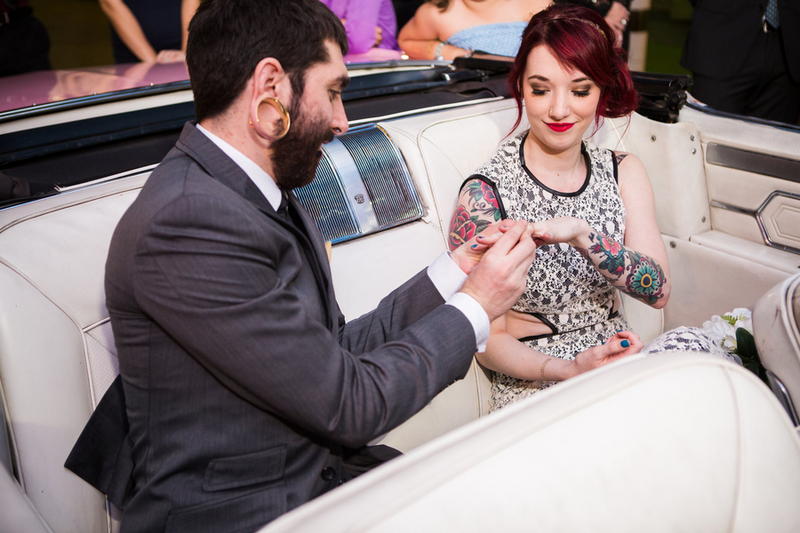 A funky vintage-inspired downtown Vegas elopement at a drive-thru, turns out. 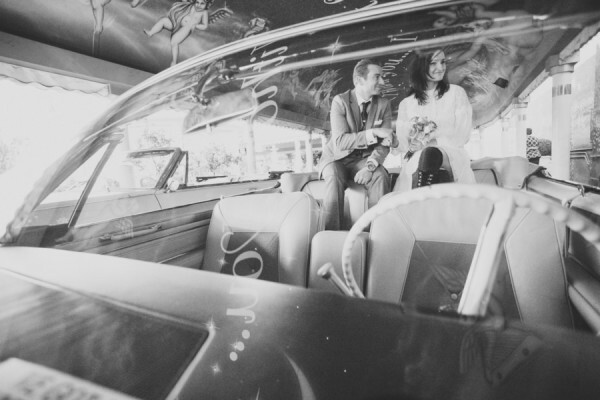 And you can’t do a drive thru wedding in Vegas in just any old car. 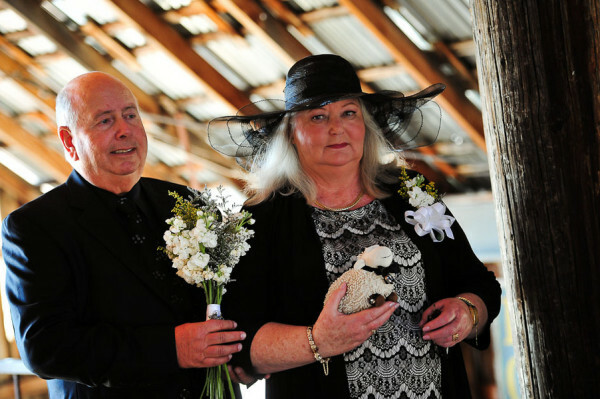 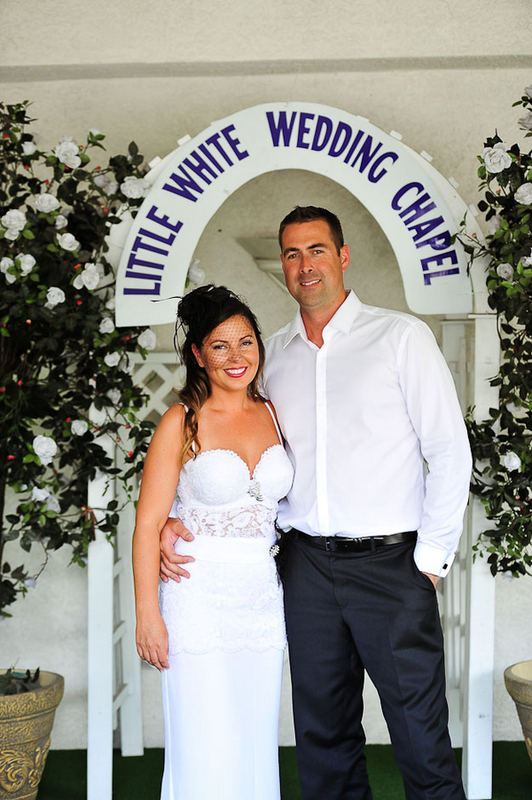 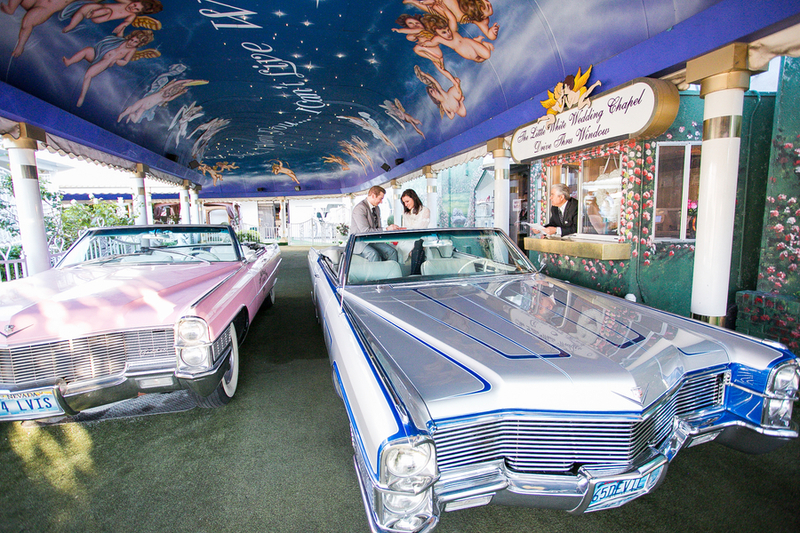 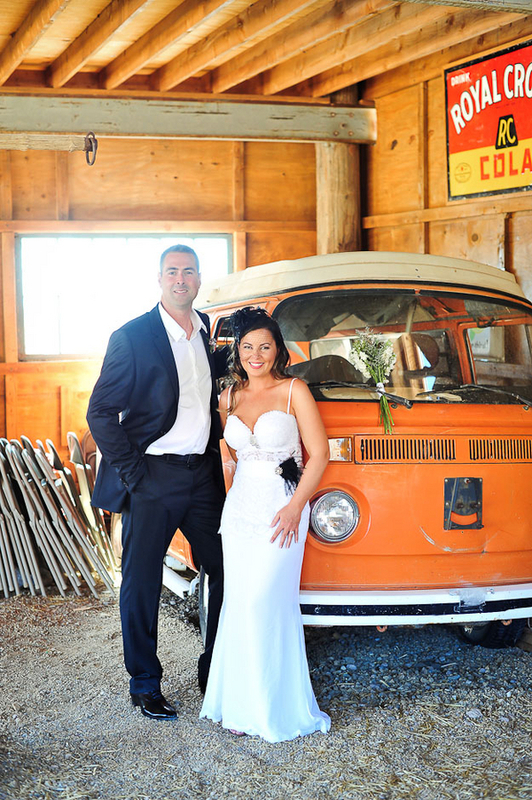 They did it up in style, and rented an awesomely appropriate 1965 Cadillac convertible, wore some awesome outfits and did things their way through A Little White Wedding Chapel’s Tunnel of Love. 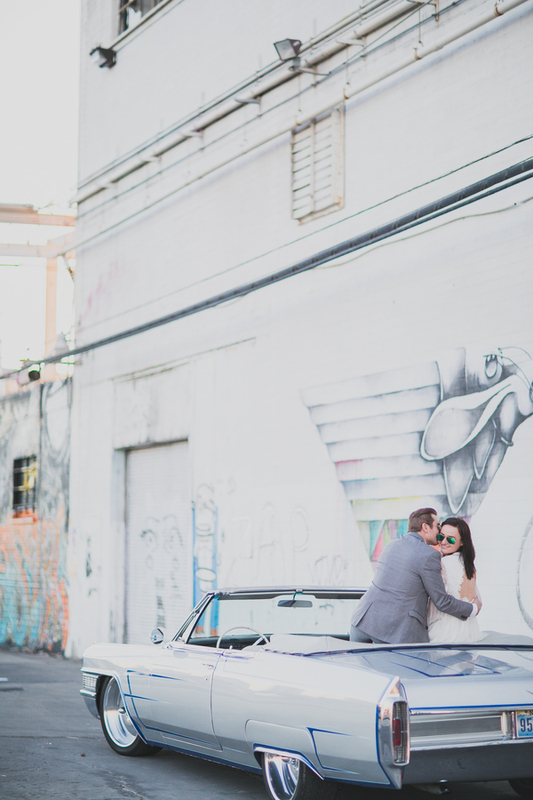 I feel like the creative, artsy backdrops and murals of downtown and the Arts District suited them perfectly, especially when the Caddy is used like a photo prop! 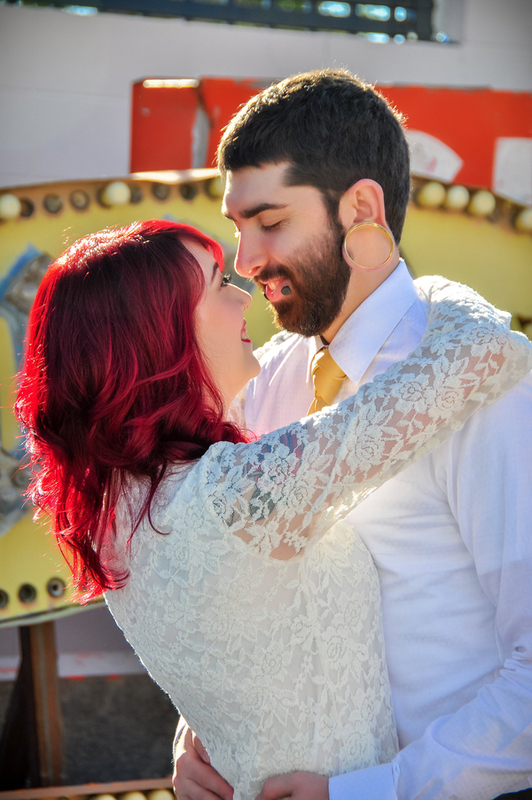 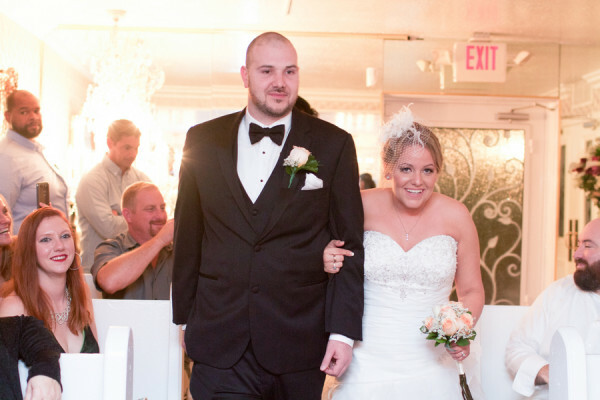 After we got engaged (December 6, 2013), we decided that we wanted to elope because we really wanted our ceremony to be an intimate one — just vows between the two of us. At the same time, we also knew that we wanted the day to be fun, light-hearted, unique and capable of capturing an old-school vibe. 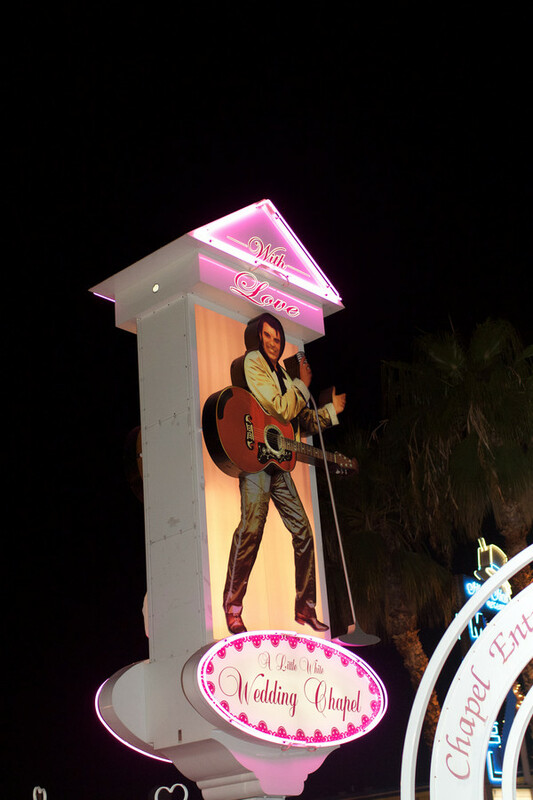 Las Vegas, with its fantastic reputation for hosting incredible weddings, and its rich entertainment history seemed like the perfect spot. 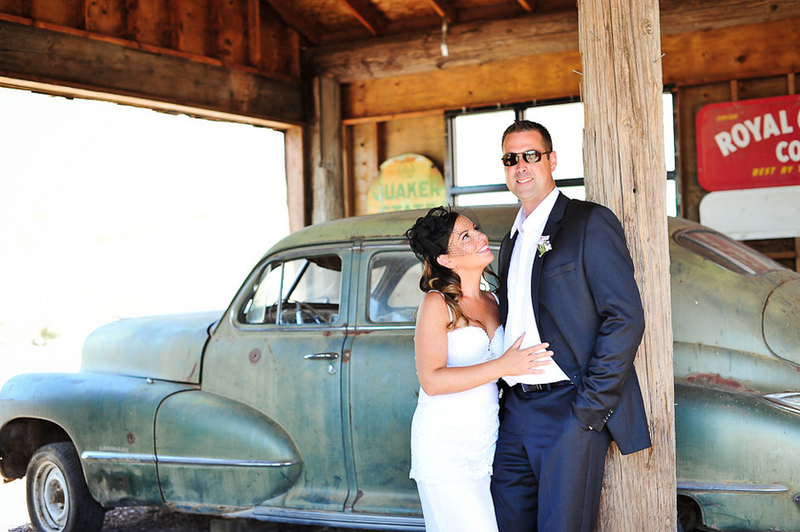 Plus, as Canadians, we appreciated the promise of a warmer climate. We also loved that, after the wedding, Vegas offered endless opportunities for celebration and relaxation, all in one exciting city. 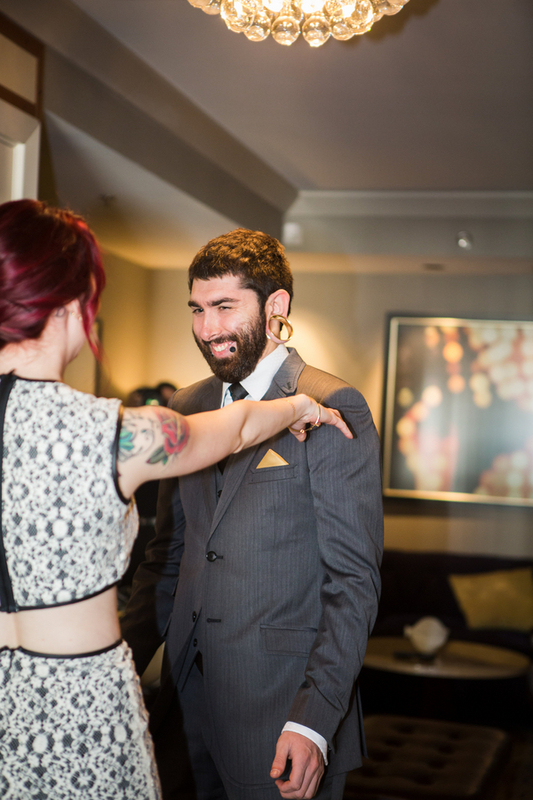 We got ready in our suite at the Hard Rock Hotel. 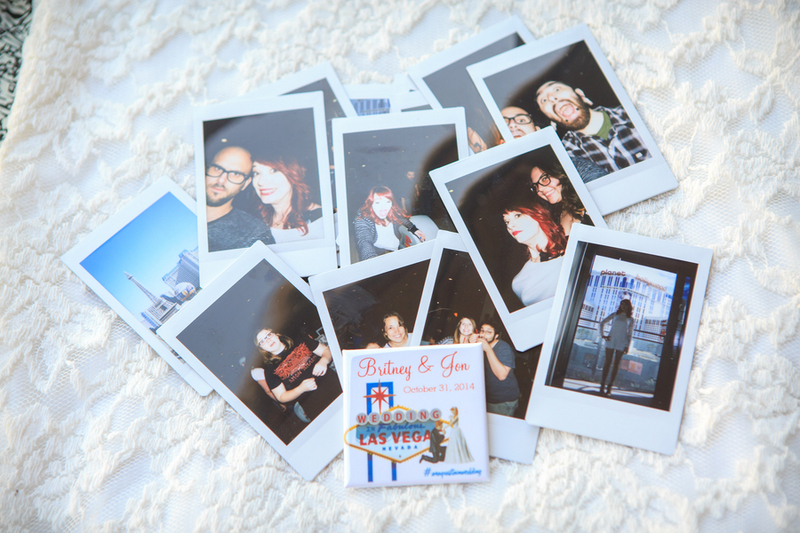 We ordered room service, put on some records (we had brought along a portable record player) and just enjoyed the experience of being together. 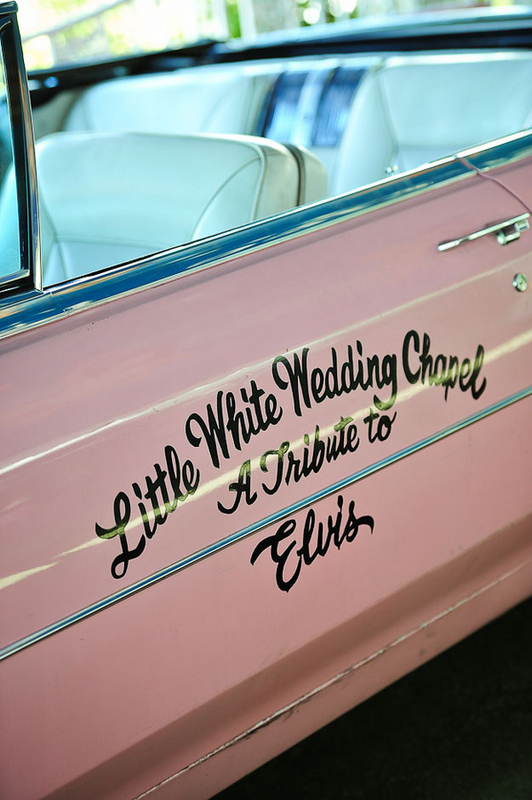 When we were ready, we drove to our venue in our rented silver Cadillac convertible. 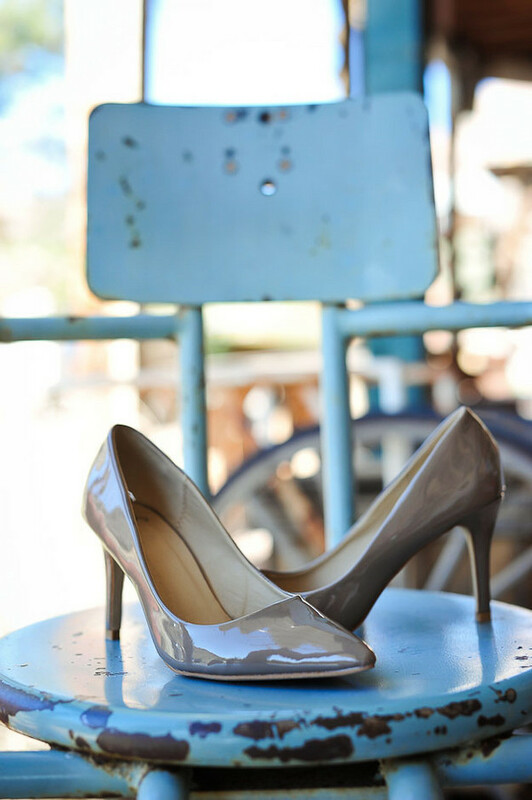 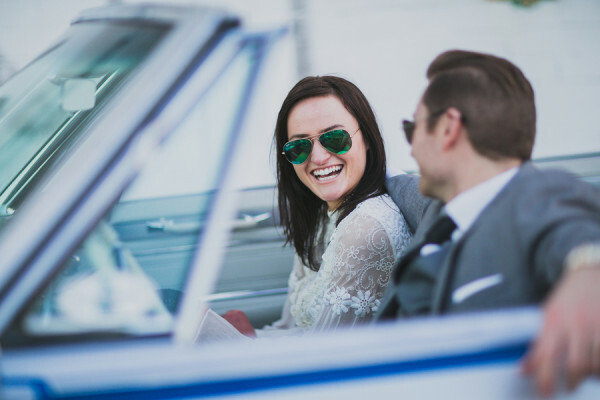 Prior to exchanging vows, however, we had to shuffle ourselves to the backseat of the car, which took some coordination, particularly for me, as I wore boots with six-inch heels. The photos of this coordinated effort may be some of our favourites, because we look as though we are engaged in a ritualistic jovial jig. 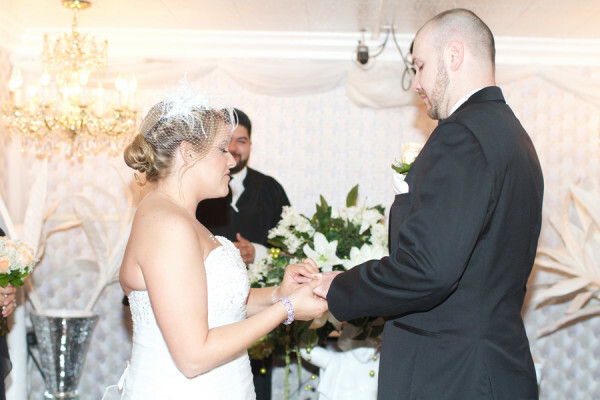 The ceremony itself was short (about 10 minutes in length), but incredibly meaningful. The vows provided by the officiant were beautiful and truly reflected what the day meant to us. We could not have written them better ourselves. 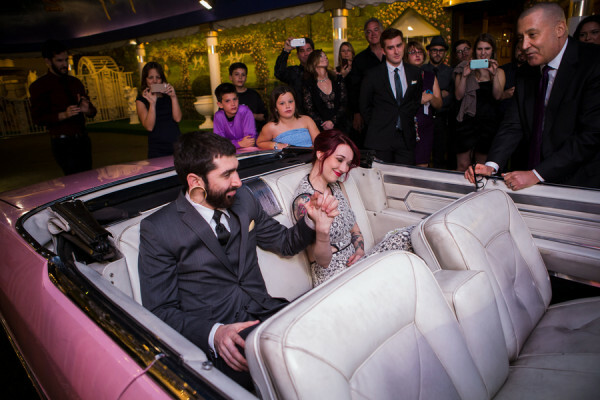 Also, with only us in the car and no other guests, the whole thing felt incredibly personal and intimate despite the casual nature of the setting. 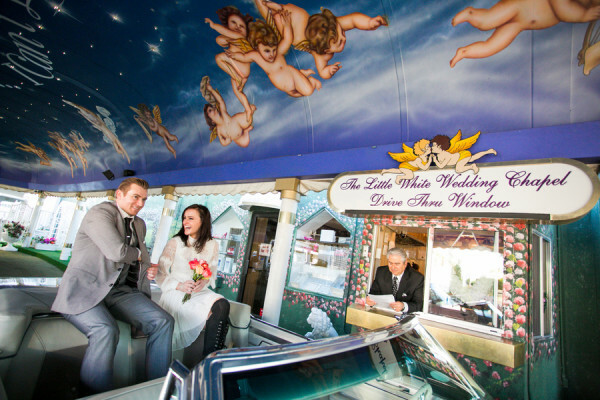 The drive-thru part of the wedding balanced out the formality of the ceremony and truly captured the relaxed ambiance for which we were hoping it. 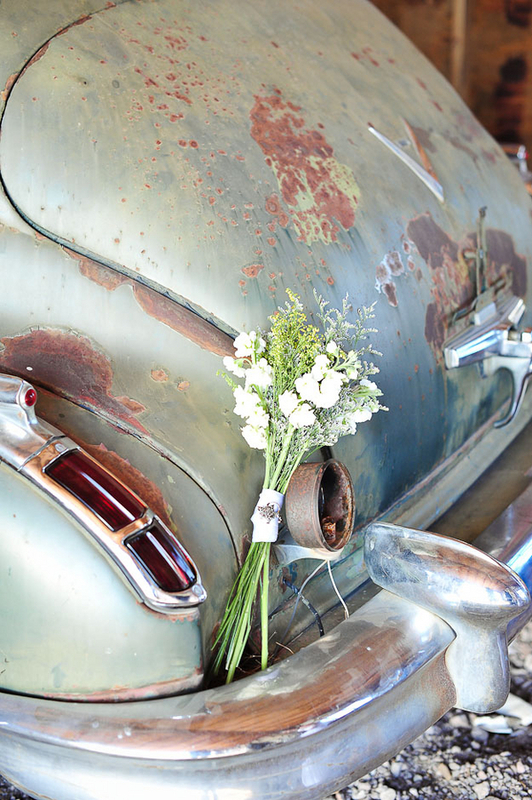 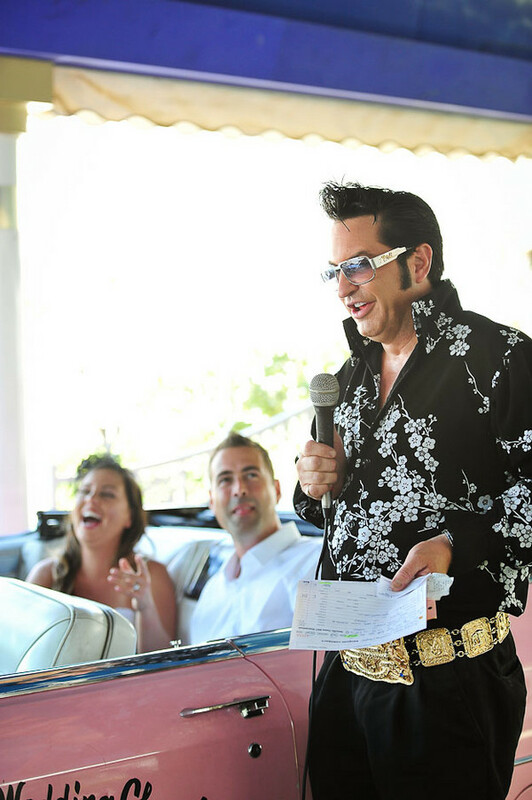 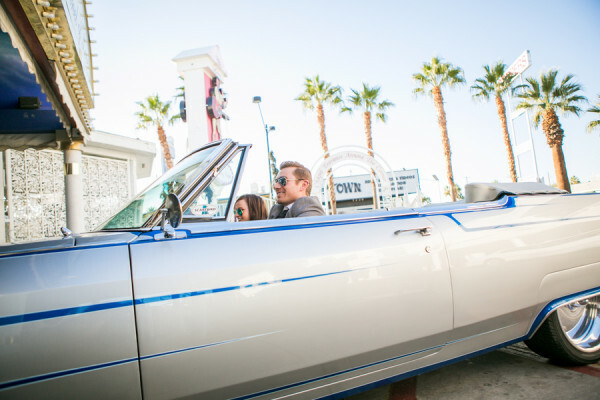 Not only did a ceremony in a vintage Cadillac feel quintessentially “Vegas”, it was also a little quirky and offbeat — a fantastic alternative to traditional options that we had hoped to sidestep by eloping to Vegas. After the ceremony, we drove along the Vegas strip in our convertible, dressed in our wedding best, with the sun setting. In a literal sense, we drove into the sunset. 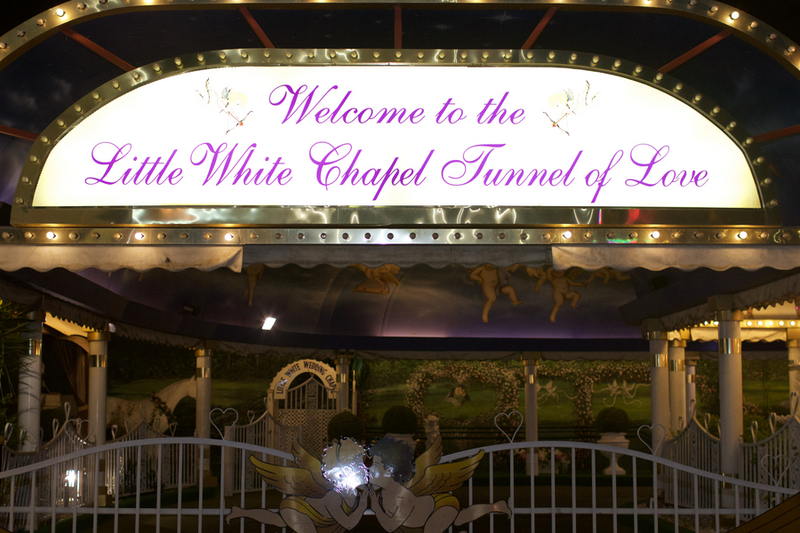 What we didn’t expect was the amount of attention this little journey would garner. 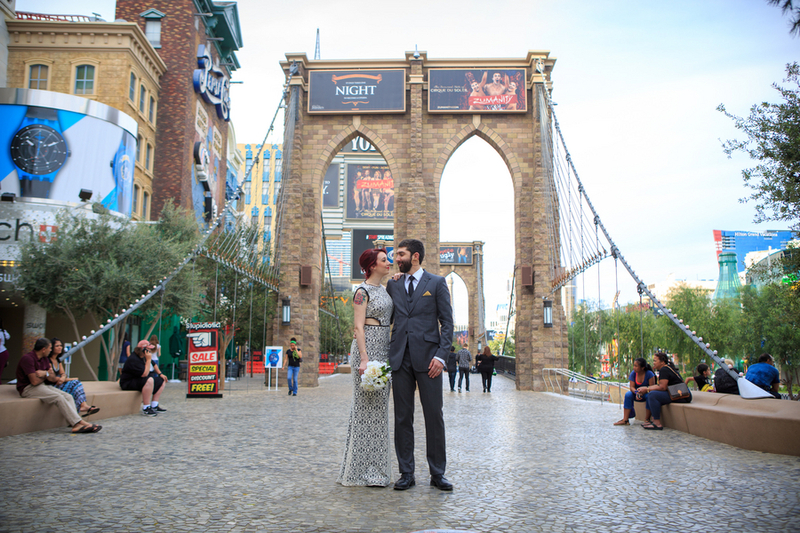 Tourists and locals snapped photos, shouted out congratulations, and ran out into traffic in hopes of getting a closer look. 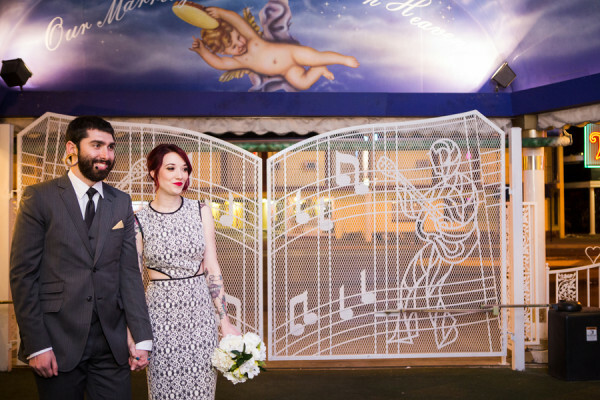 It was a great way to be greeted into married life! 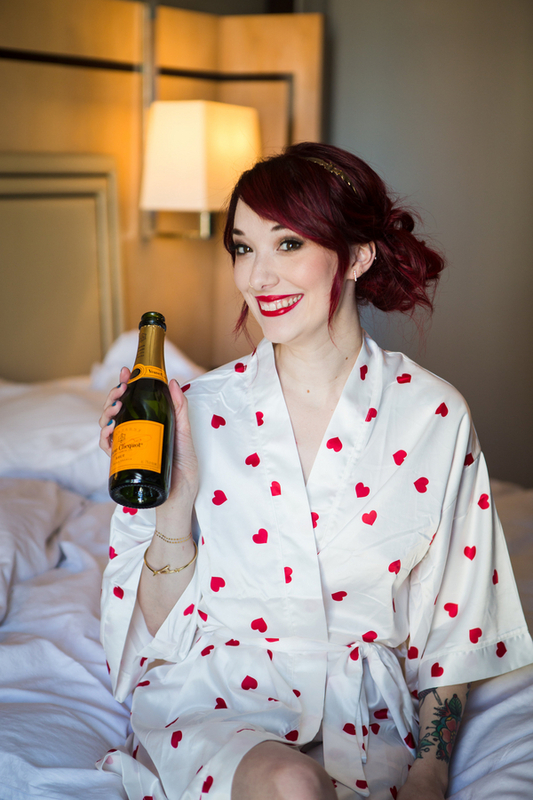 When we arrived back at our hotel, we enjoyed some pink Champagne before heading out for old-fashioned cocktails and steak tartare at Gordon Ramsay Steak in Paris. After dinner, we returned to our suite, where we ate our custom-made cherry crumble pie in bed (thanks to the Bouchon Bakery!). 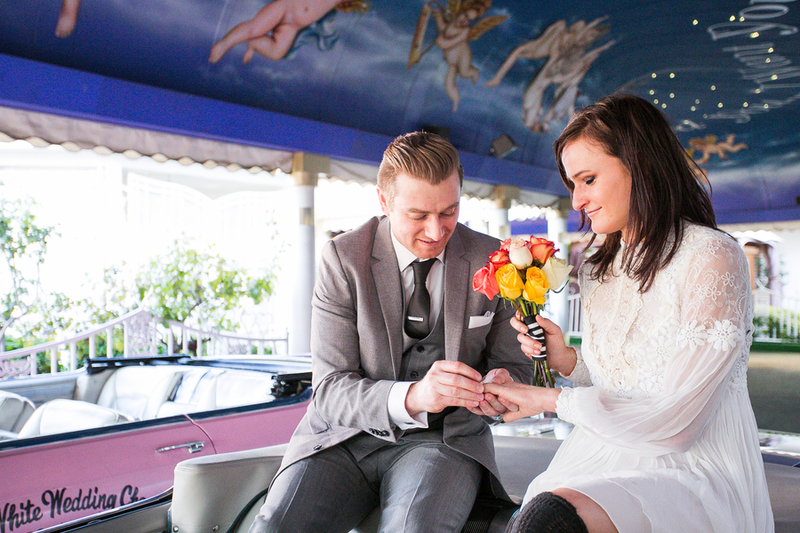 It was the perfect ending to the perfect day. 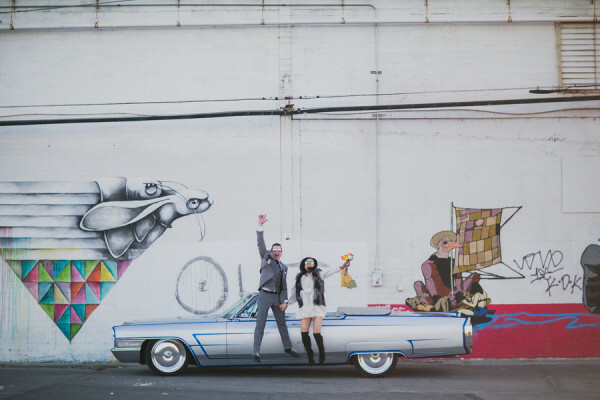 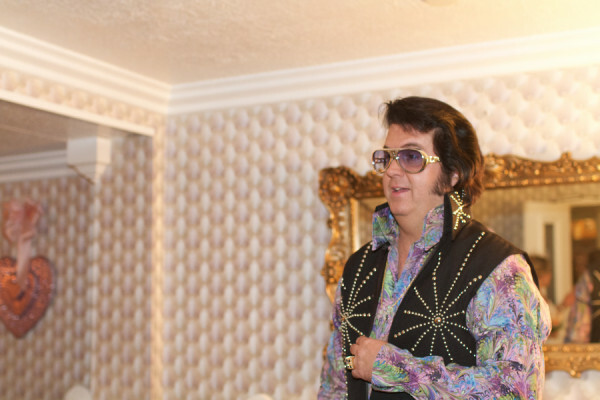 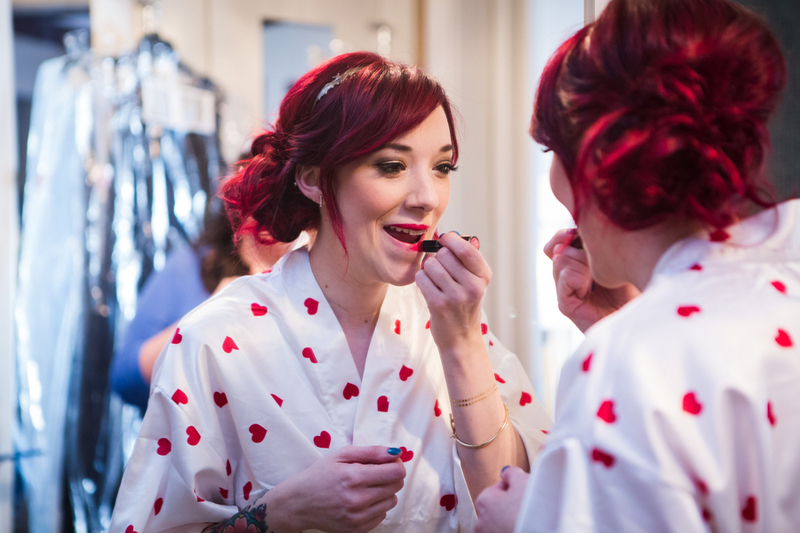 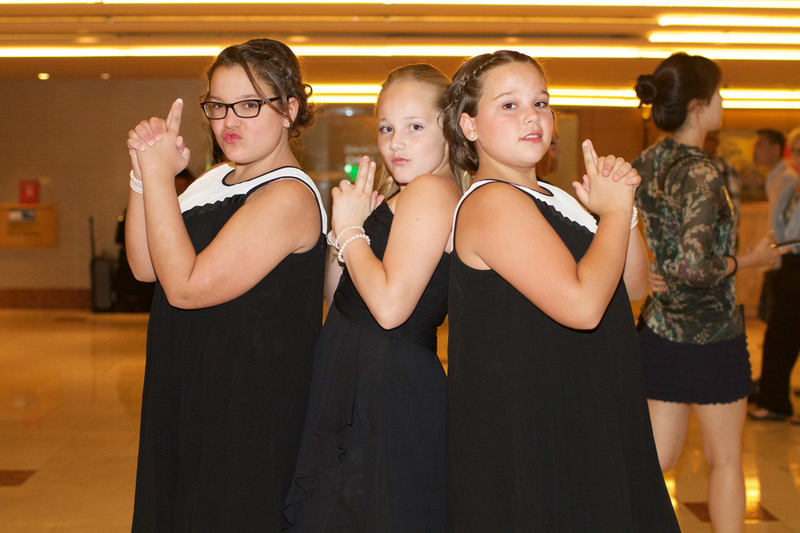 Although our ceremony and overall wedding did not have an explicit theme, the elements included in our day all had a vintage, throwback, rock-and-roll feel. Between Mike’s classic 1950s look, my bohemian 1960s style, the classic car, our beloved vinyl records that had made the trip over in a suitcase and the perfect Vegas backdrop, everything came together to create an eclectic old-school atmosphere that felt truly authentic. 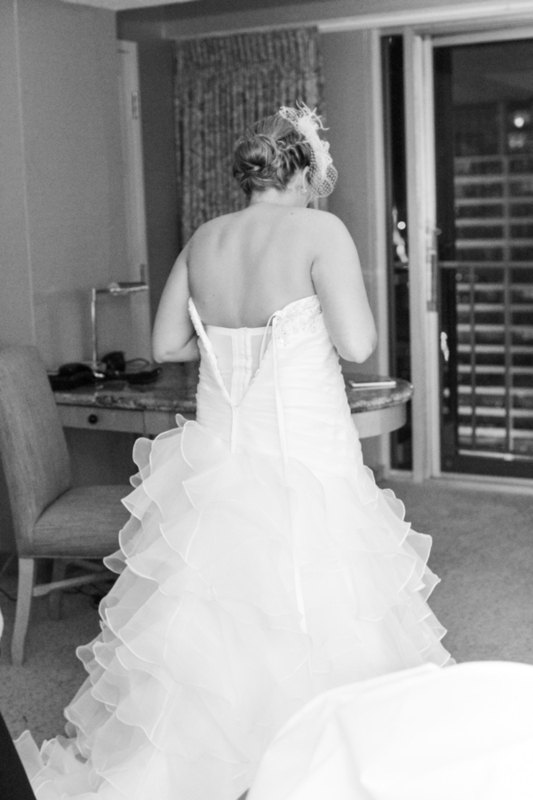 Livia’s dress is amazing, isn’t it? 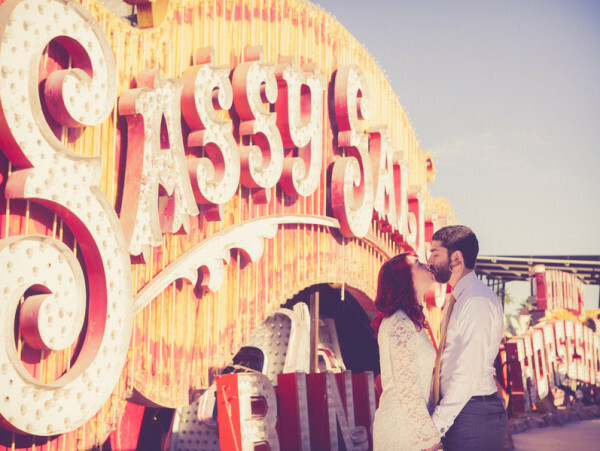 They ended up using one of these fab Amberlight Collective photos to announce their wedding on Instagram two weeks after the elopement. 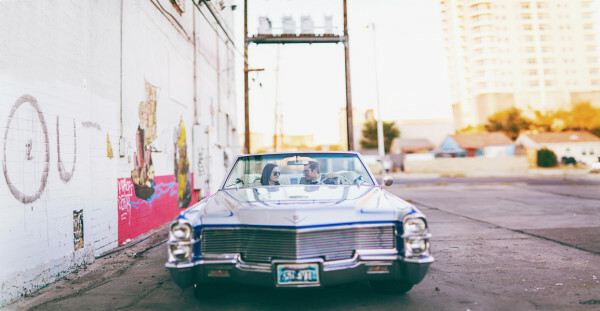 No fuss, no muss. 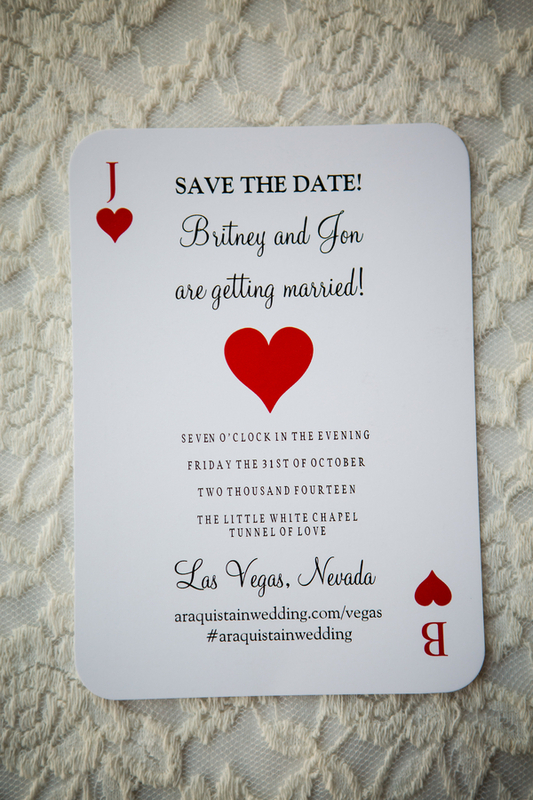 Britney and Jon decided Vegas was the perfect spot for a Halloween wedding — the anniversary of their first date! 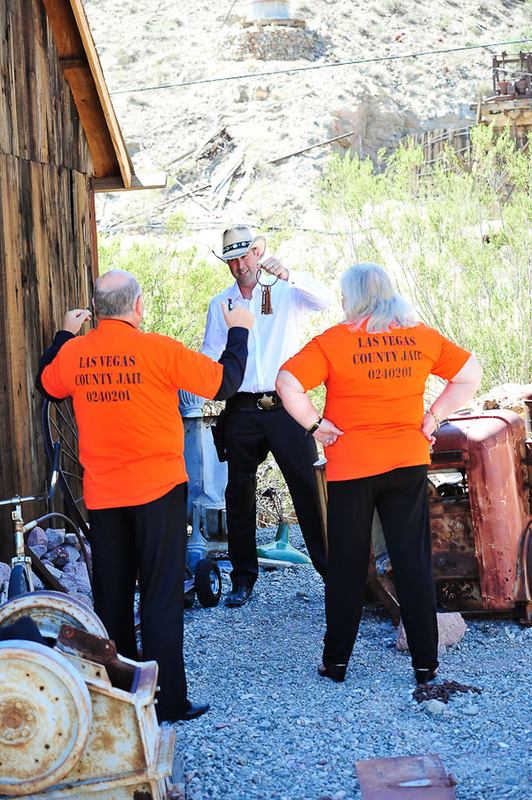 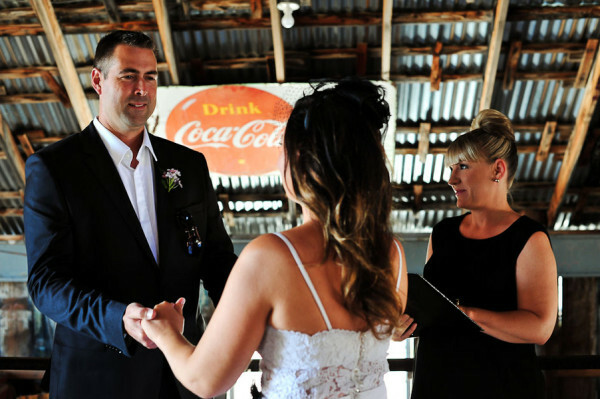 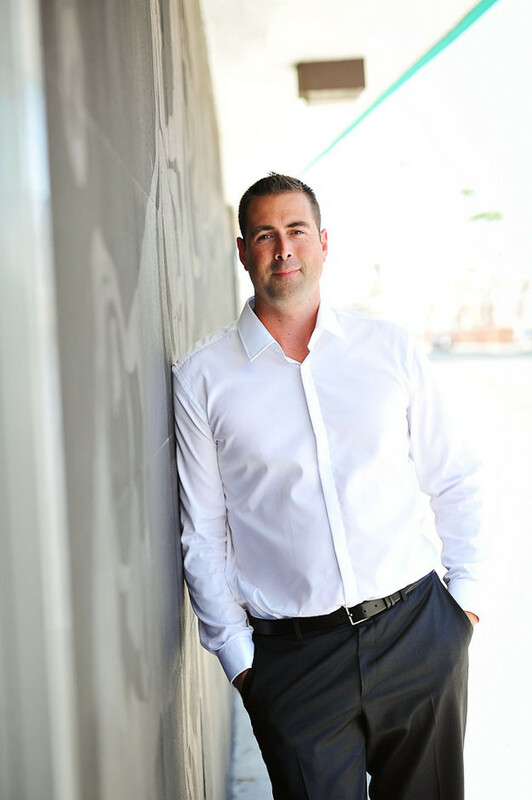 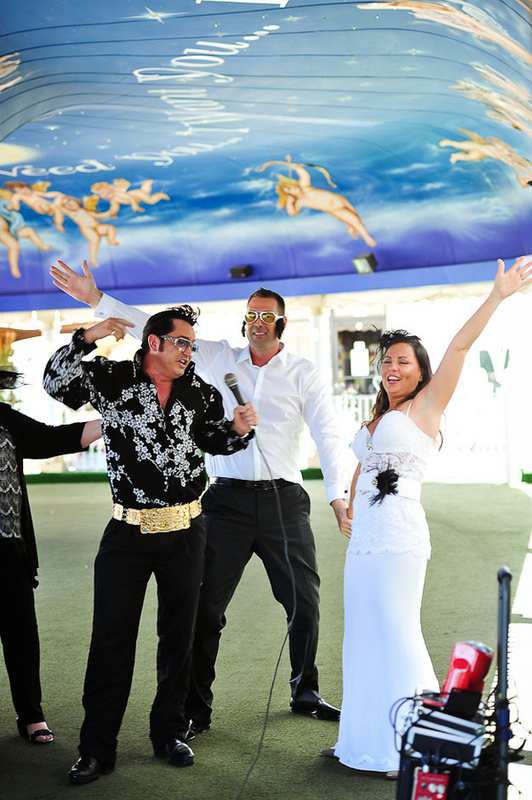 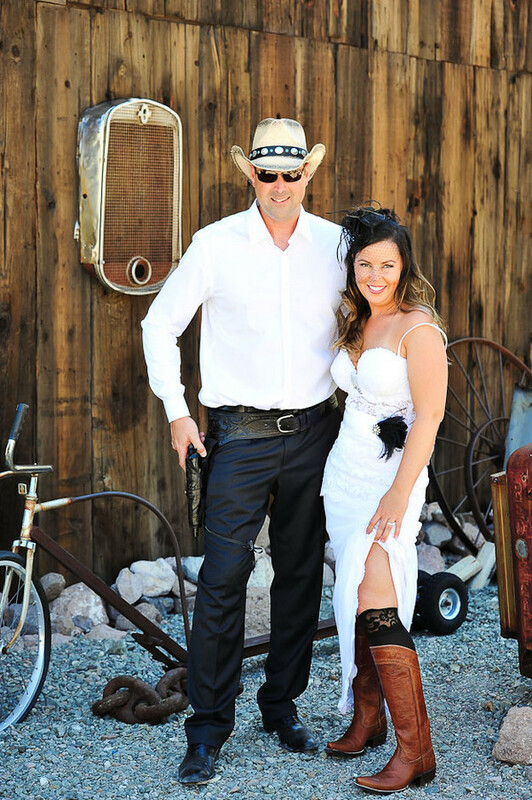 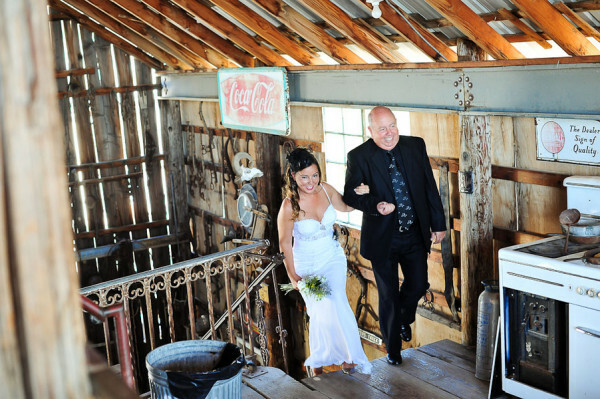 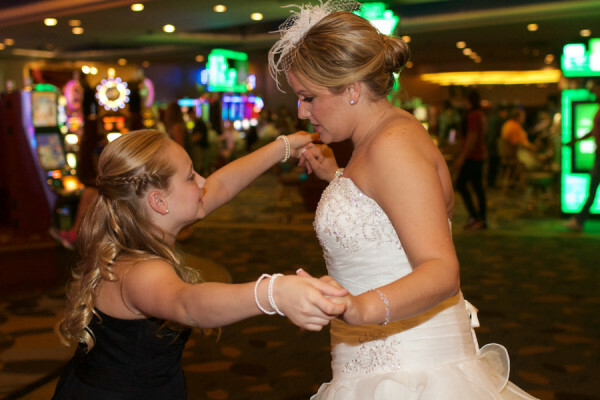 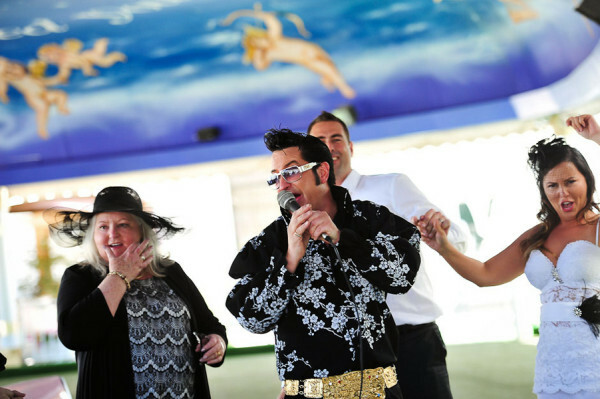 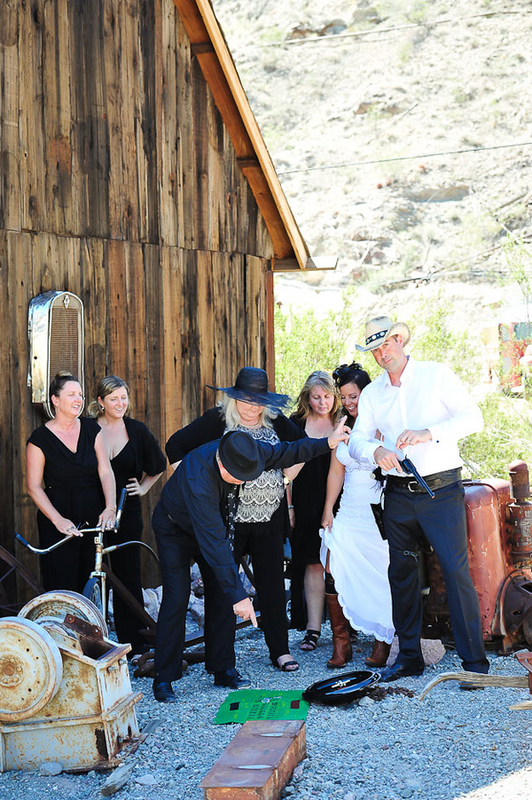 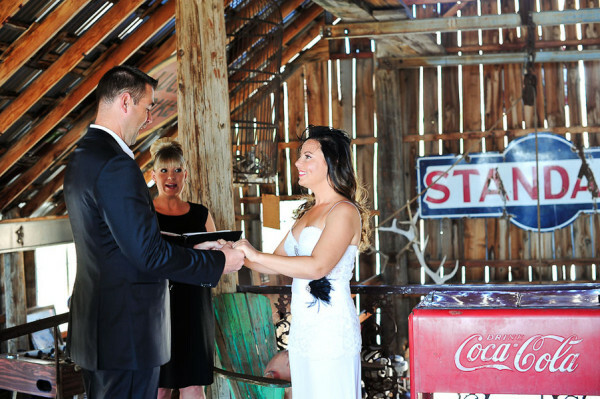 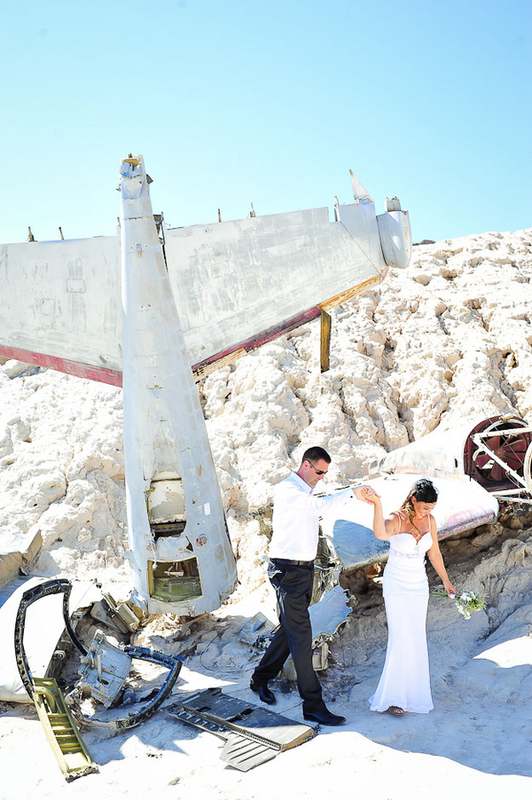 They didn’t go with an overt theme but spread the wedding fun throughout two days, including a drive-thru wedding in downtown Las Vegas and a bridal photo shoot at The Neon Museum. 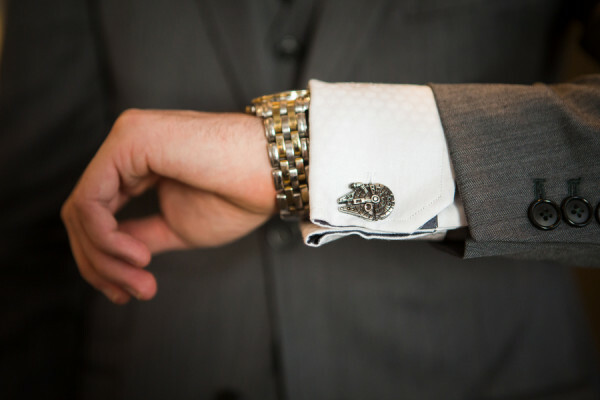 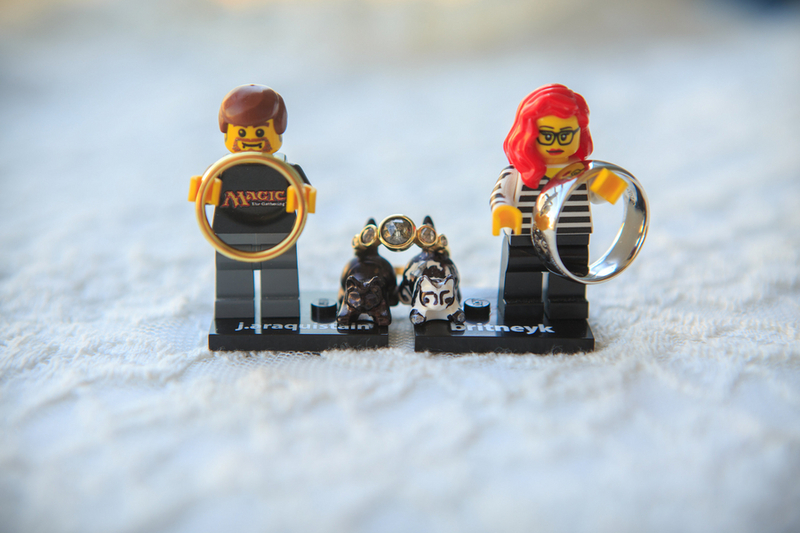 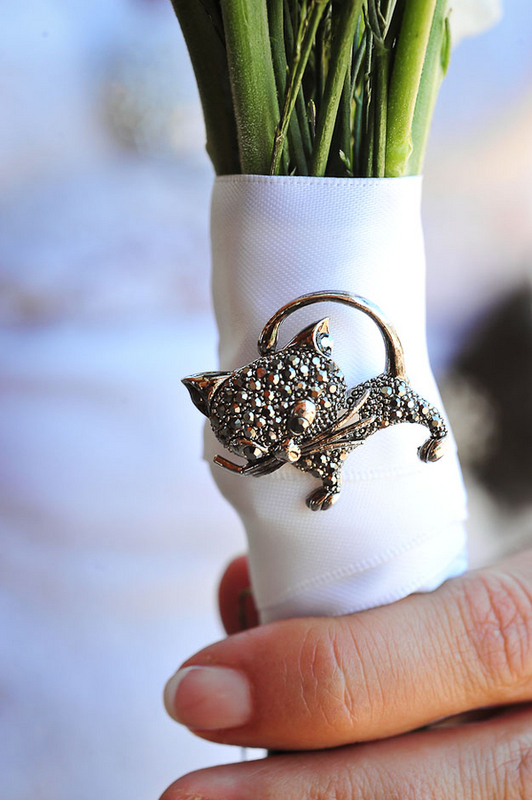 This destination wedding was on the intimate side, but Britney and Jon were able to infuse many personal touches into the day, including a custom LEGO minifig cake topper, playing card stationery and super cool Millennium Falcon cufflinks. 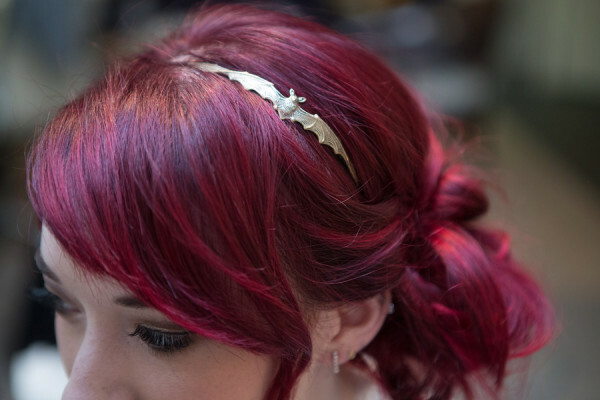 A touch of Halloween was included in the glam gold bat headband Britney wore. 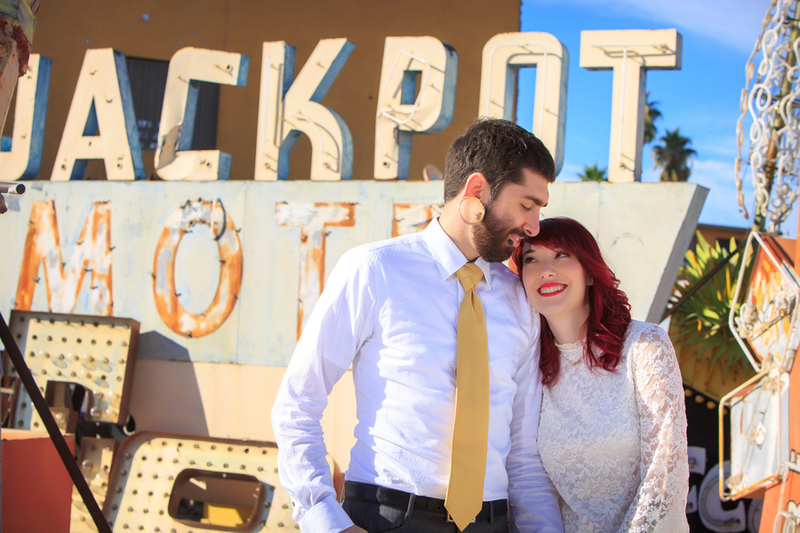 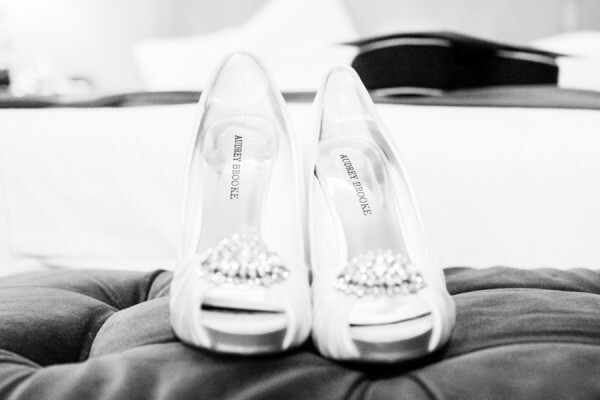 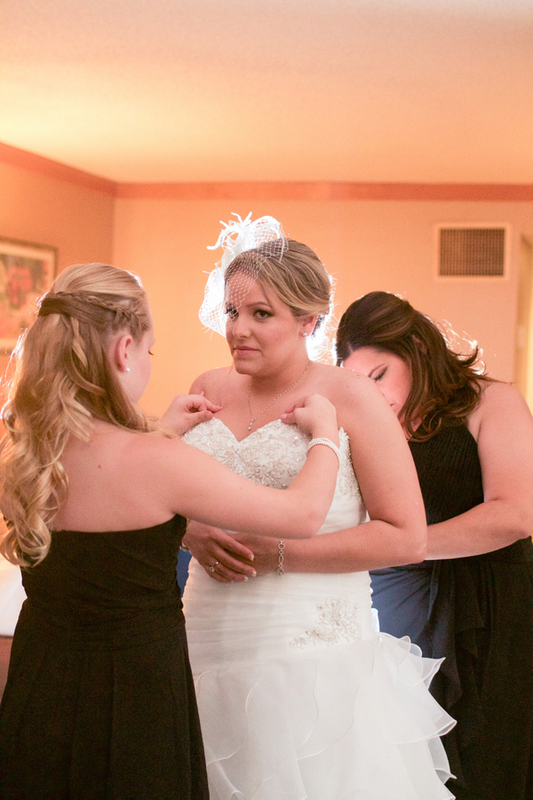 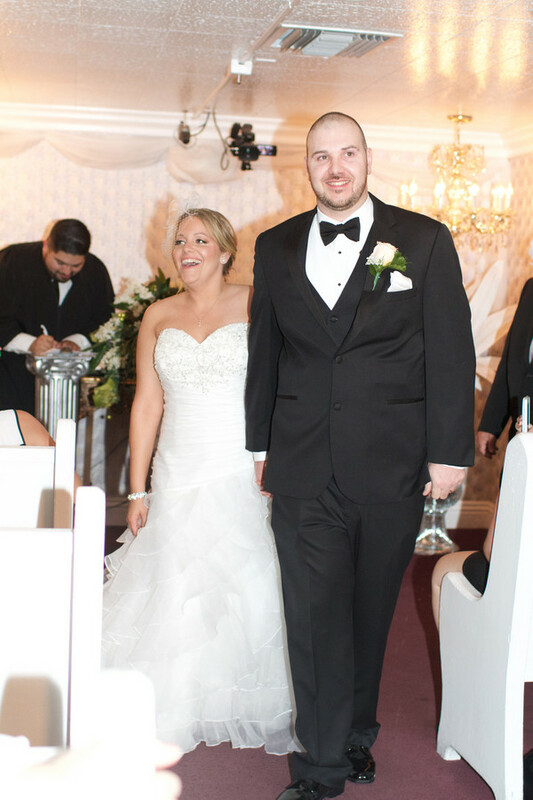 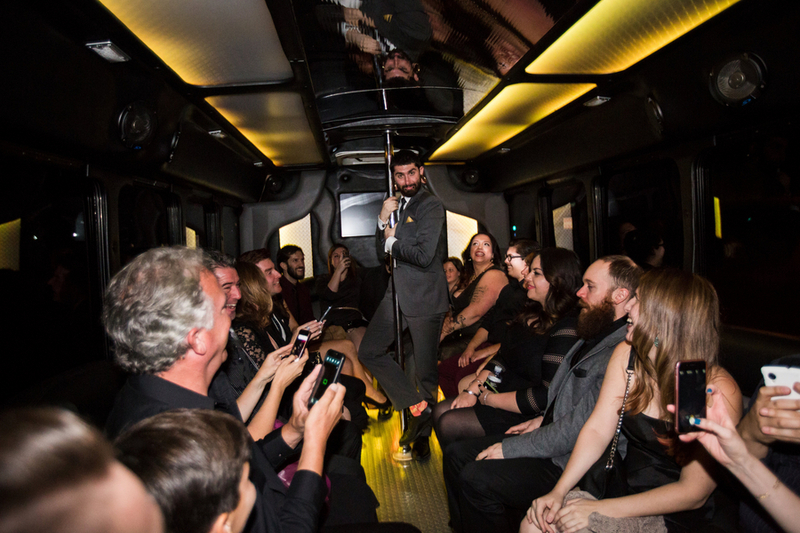 Keep reading for more about this unique Vegas wedding from their photographer! 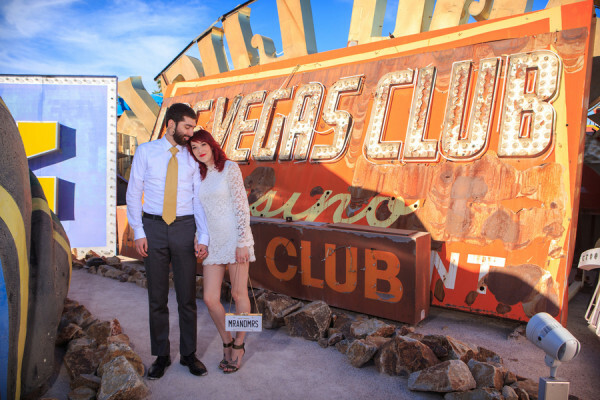 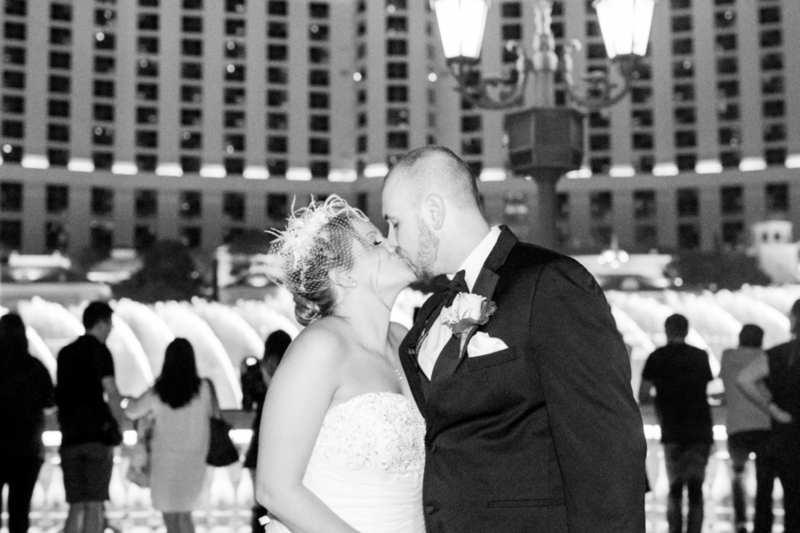 Britney and Jon wanted to embrace what a Vegas wedding had to offer and after getting to know them better during our two day photo shoot I would have to agree that it was the perfect choice for them. 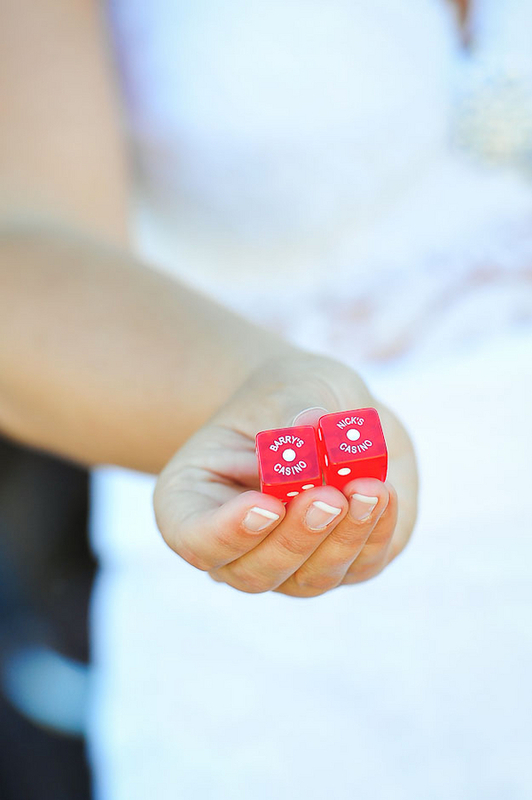 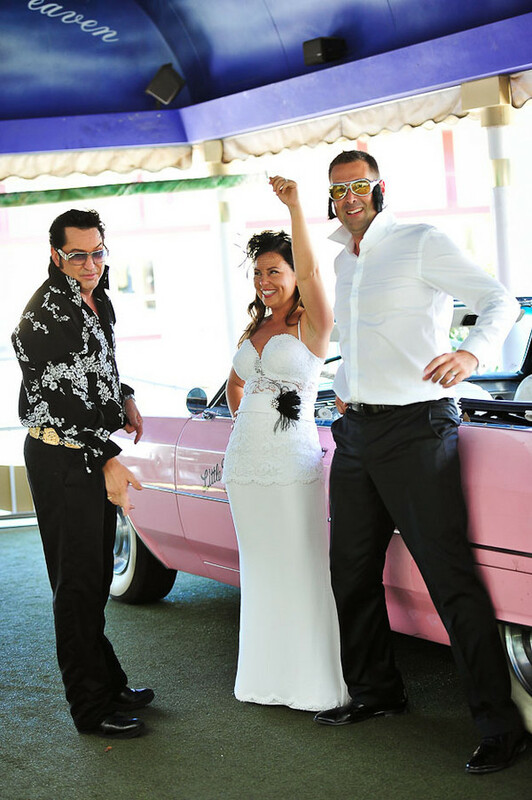 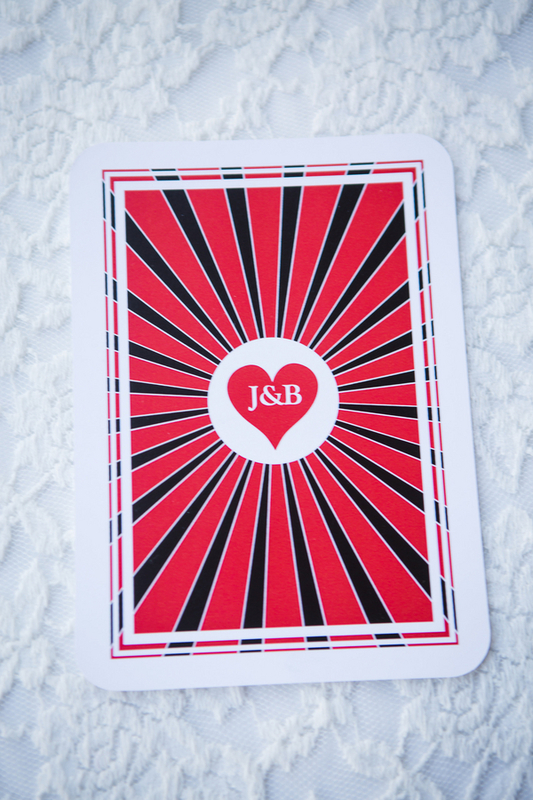 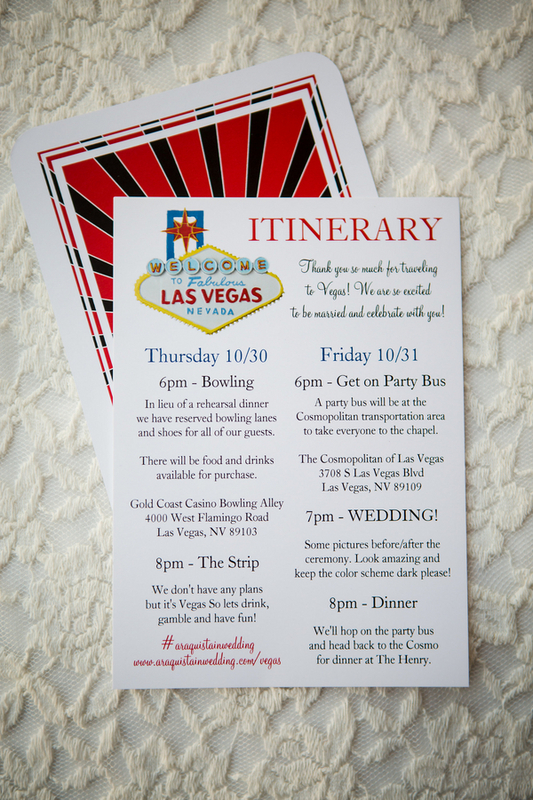 From the playing card themed invitations to the iconic pink convertible where they exchanged their vows and rings, this bride and groom focused on the details to pull off a fun and memorable event that revolved around them as a couple. I feel that too often a lot of couples can get overwhelmed with the amount of stress and work that goes into the grand production which is a traditional wedding. 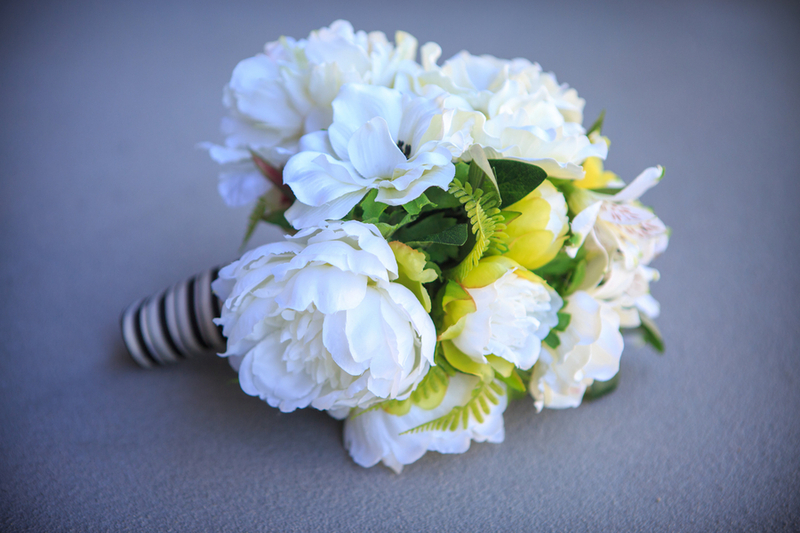 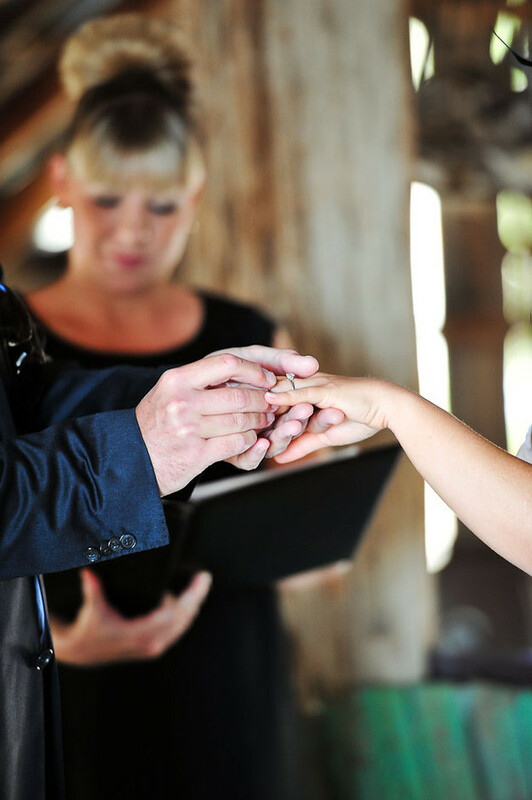 If you are one of those couples who is fighting with your soon to be spouse over the budget or the guest list, my advice is to take a deep breath and always remember that your wedding day, traditional and elopements alike, is about the two of you. 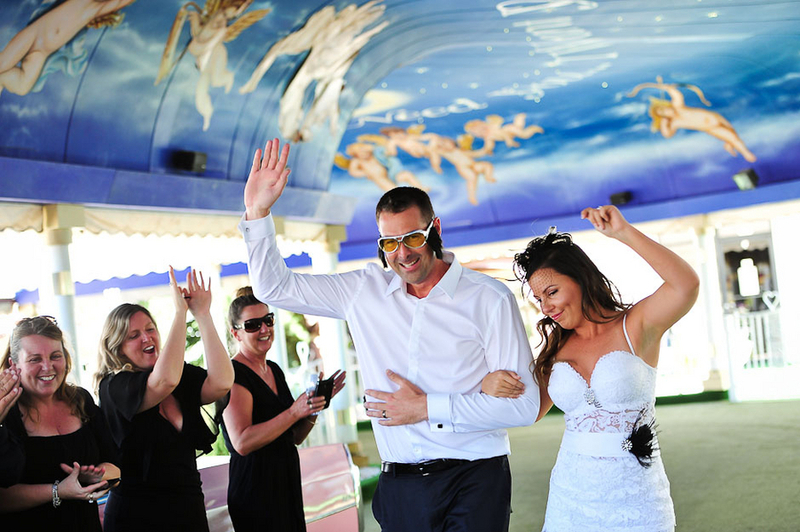 So take a page from Britney and Jon’s book and make your day about you, make it memorable and make it fun! 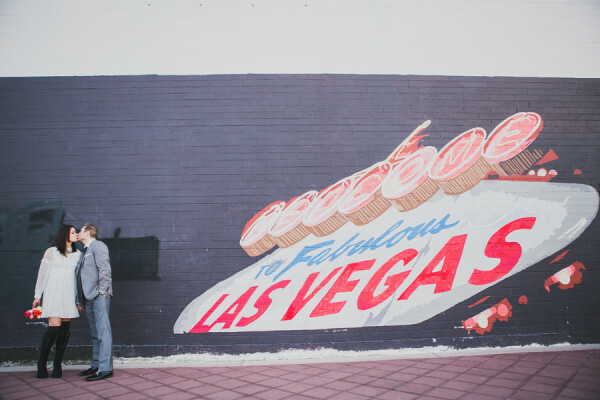 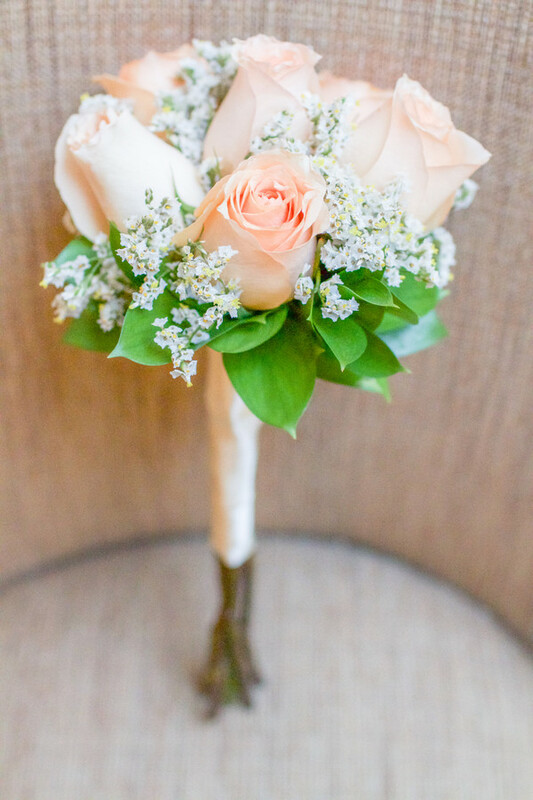 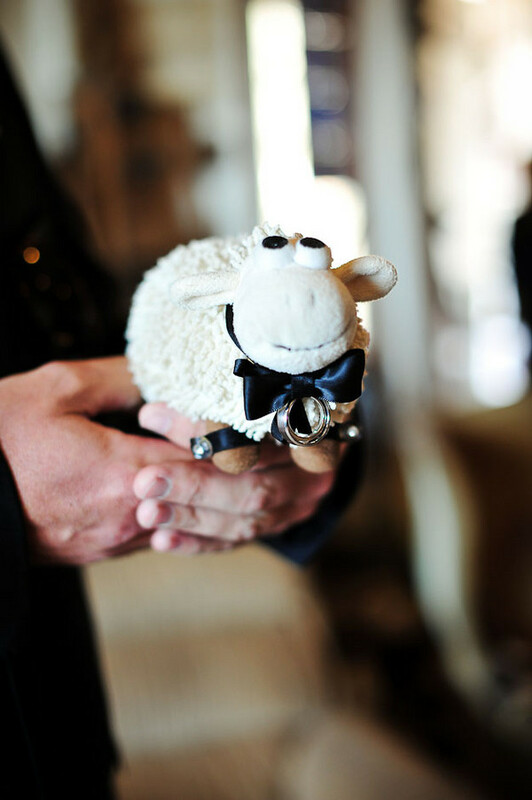 Welcome to Throwback Thursday, when we delve into the archives of Las Vegas photographers, wedding vendors and wedding planner blogs to reveal weddings you may have missed.